The east–west streets at the northern end of the Howard de Walden Estate in Marylebone – Devonshire Street, Weymouth Street and New Cavendish Street – are notable for the prevalence of a particular building type: the so-called ‘bijou’ house fronting the main street at the corner of a mews, where established rights to light restricted building to two, or at most, three storeys. 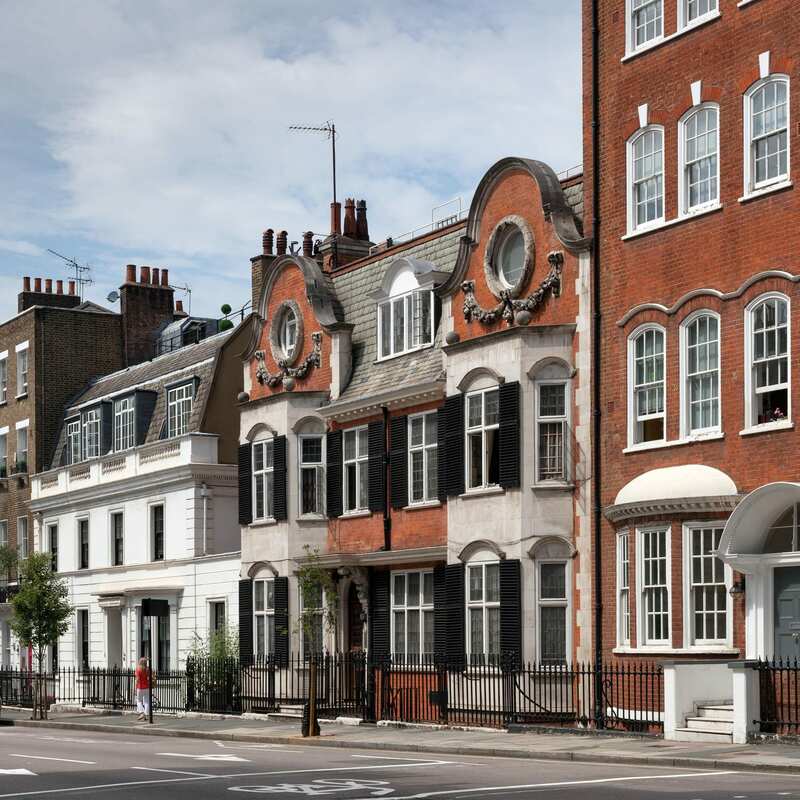 Sometimes detached, often double-fronted, these smaller houses made a major contribution to the streetscape where there had formerly been only the blank return walls of the big houses in the grander north–south streets like Harley and Wimpole Streets, or their lowly mews additions. 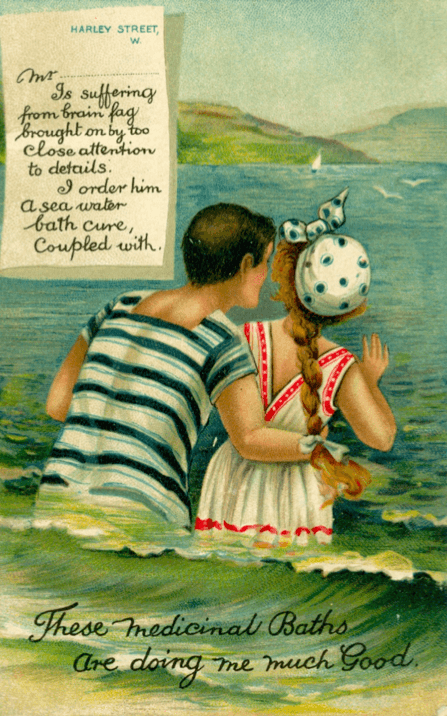 Though this was a predominantly turn-of-the-century phenomenon, there were antecedents. A little house facing Devonshire Street (now 117a Harley Street) had been partitioned out of a corner house on Harley Street (No. 117) by the mid 1840s. 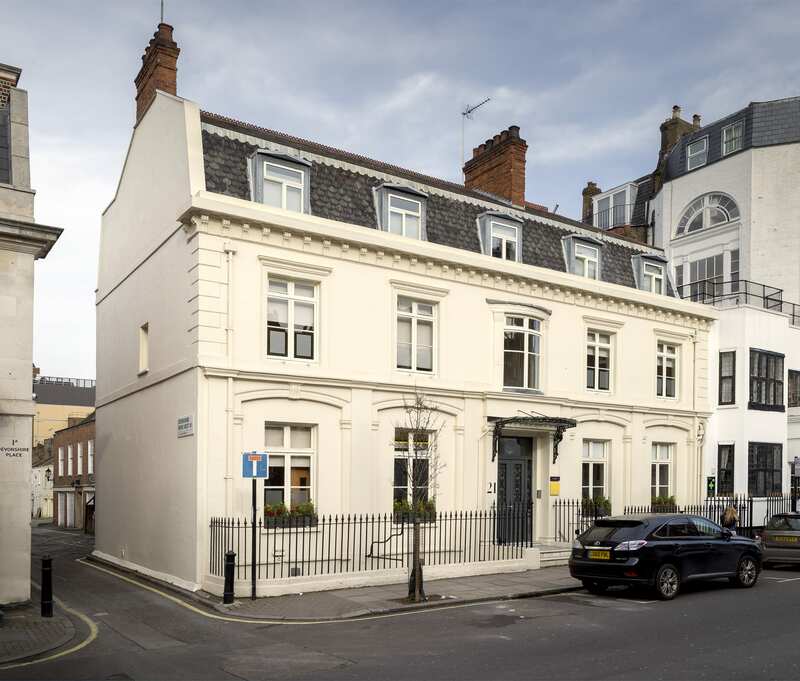 In 1855–6 a stuccoed, Regency-style two-storey house was added next door (now 21 Devonshire Street) on the site of a stable building at the corner with Devonshire Mews West, and was imitated twenty years later by a pair in like clothing on former mews plots on opposite sides of Weymouth Street (Nos 36 and 43, of 1870–4). But unlike the later examples, these do not appear to have been part of a conscious trend. 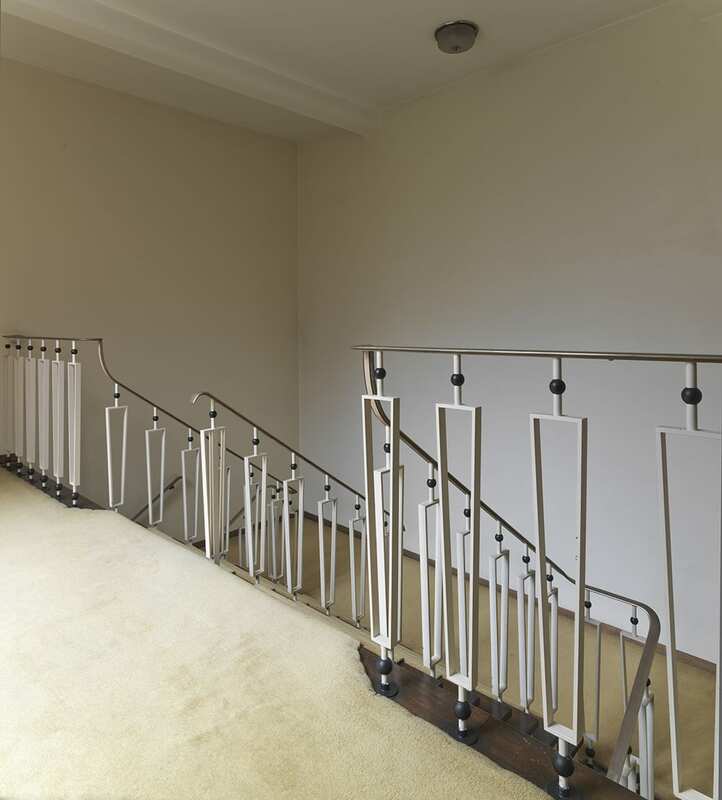 That trend began with Barrow Emanuel, partner in the successful London-Jewish architectural practice Davis & Emanuel. 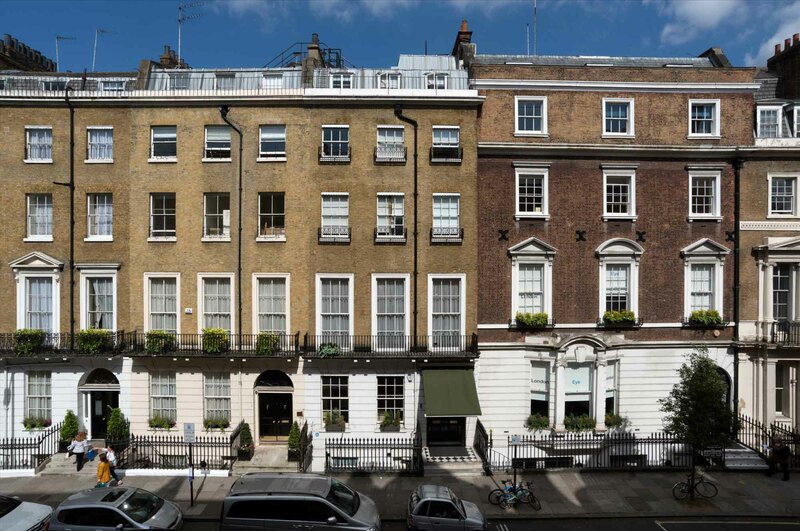 In 1886 he negotiated for a sublease of the old stable block at the rear of a corner house at 90 Harley Street, asking if the Estate would be happy for him to rebuild not with stables but with a small house facing Weymouth Street (now No. 32a). 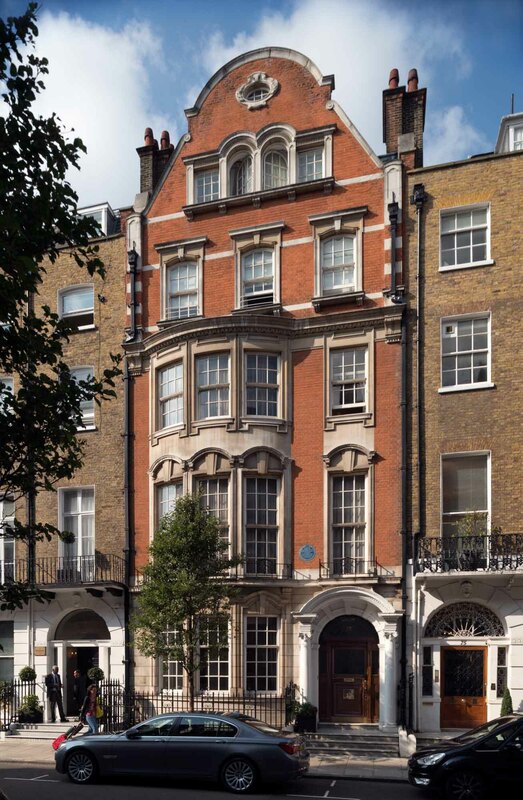 Its success encouraged Emanuel to do likewise in 1894–5 with the similar site opposite, at the rear of 88 Harley Street, where he built another new house (33 Weymouth Street); and he was disappointed in 1898 not to secure a further such plot on New Cavendish Street (No. 55), behind 67 Harley Street, but the fashion had by then caught on, and competition and prices were rising sharply. 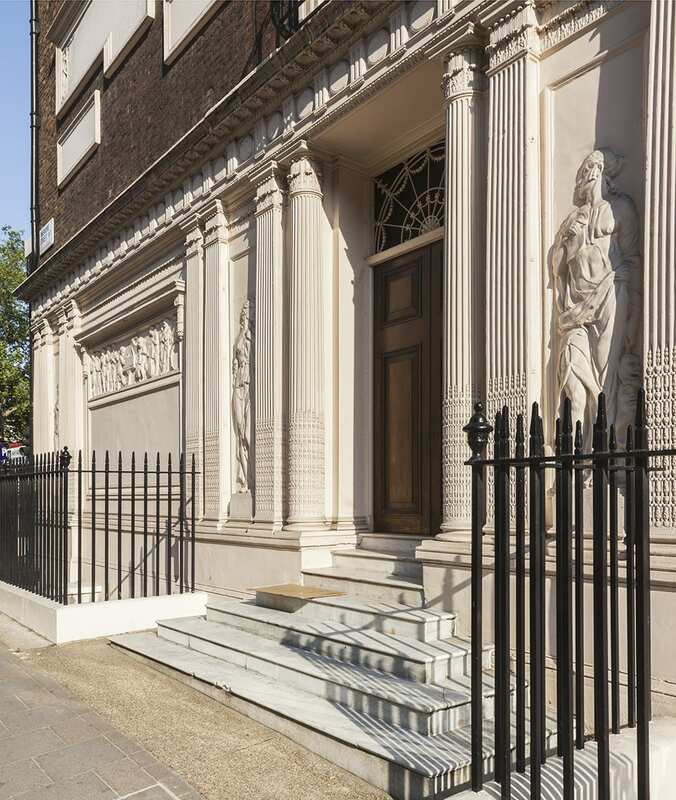 By that date Emanuel had built a comparable ‘bijou residence’ for his own use at 147 Harley Street (since demolished). No. 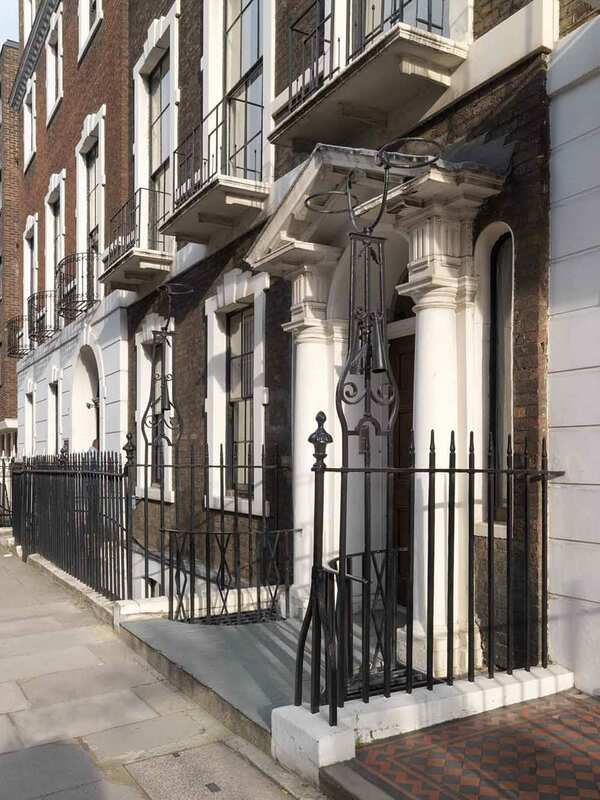 114a Harley Street, of 1903–4, erected facing Devonshire Street, seems to be the last of his creations of this type in the area. 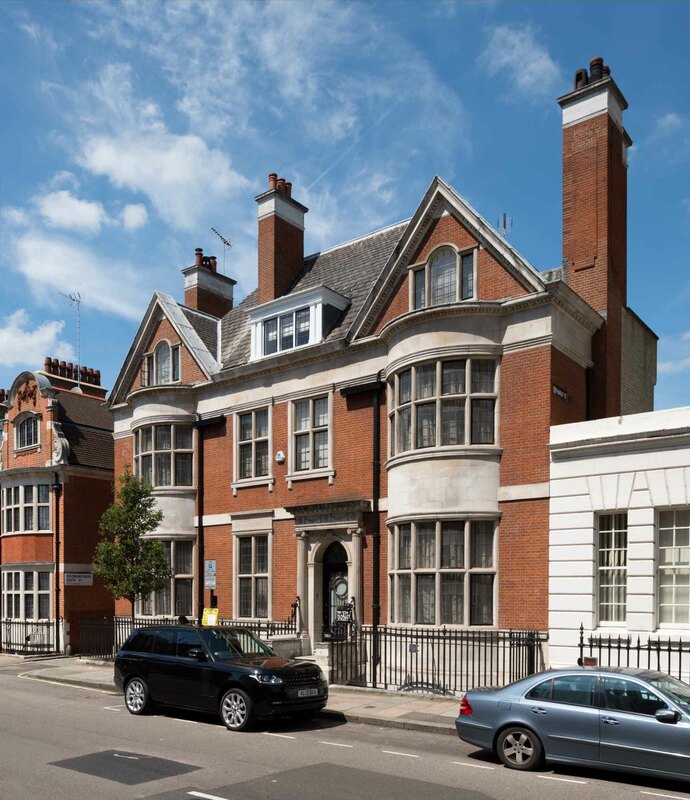 Stylistically, the red-brick and stone Emanuel-era houses of the 1880s and 90s can be viewed as part of the Queen Anne and neo-Jacobean domestic revival that had proved popular in Kensington for large residences, but here on a more intimate scale. The occasional use of bay windows, porches or asymmetry added to the interest of their façades. Greater variety arrived in the early 1900s when neo-Georgian or freer Flemish styles were also adapted to such plots, and sometimes a more severe Baroque stone-fronted neo-classicism. Such houses were necessarily compact in plan but often offered a more convenient and modern arrangement than the older, bigger terraced house types, all the reception rooms being gathered together at ground-floor level, leaving the upper floor for main bedrooms and bathrooms. As a result they were suited to fewer servants and relatively cheap to run from the domestic point of view. 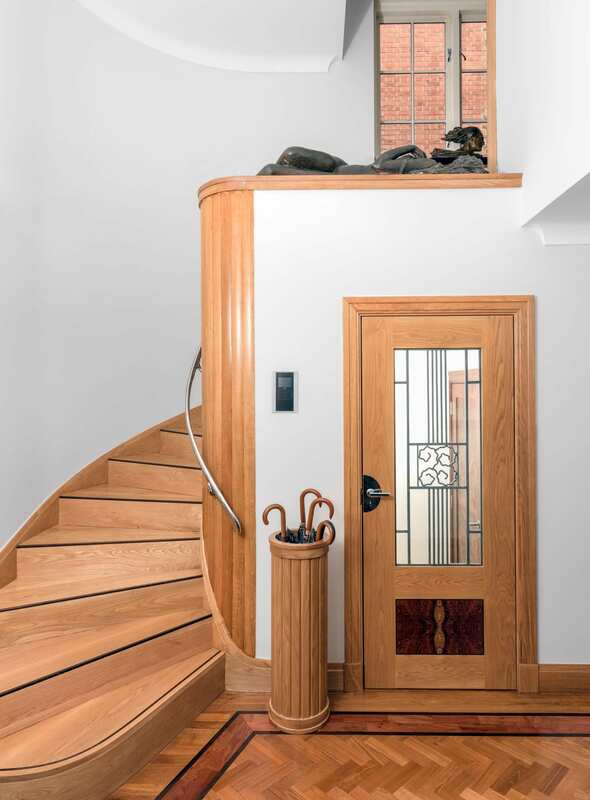 For many turn-of-the-century residents who still preferred a degree of privacy or separation, this was a more attractive alternative to the expensive big houses than the increasingly popular blocks of flats. Though sometimes referred to (inaccurately) as ‘maisonettes’, they were more commonly known at the time as ‘dwarf’ houses, on account of their comparative lack of height. It has been suggested that this crop of stylish ‘dwarf’ houses was an attempt by the Howard de Walden Estate to reintroduce residential use in an area where commerce, medicine and institutions had all but taken over. But the process was driven more by speculators and developers than by the Estate; and though frequently proclaimed as ‘private’ residences, they were more often than not first taken by (and many seem always to have been intended for) medical practitioners as consulting rooms with living space above. 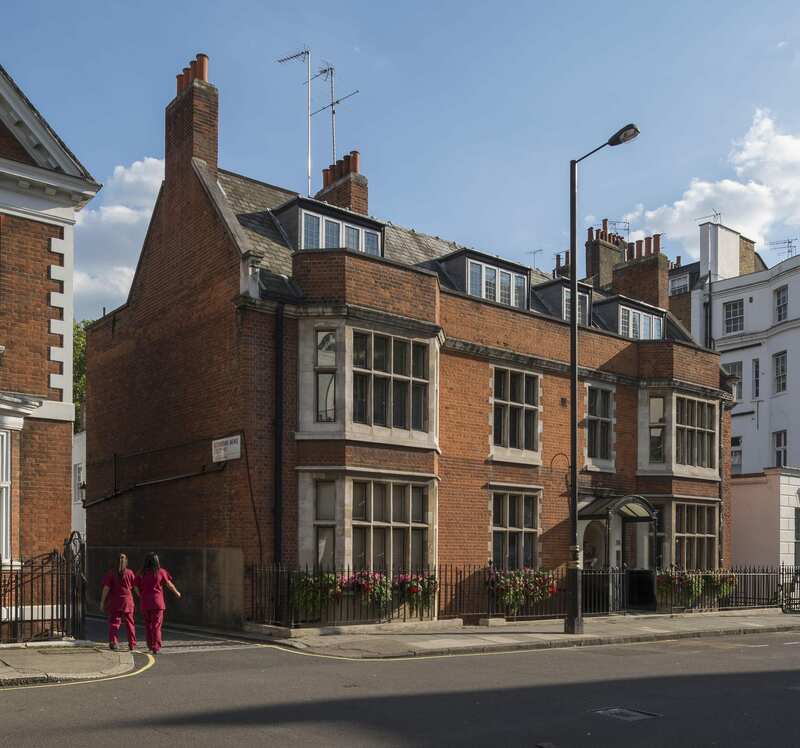 114a Harley Street dates from 1902 and was the last of the architect Barrow Emanuel’s effective mews corner houses – asymmetrical, partially gabled, in red brick and warm stone, and with a pitched red-tiled roof pierced by dormers. Its first resident in 1905 was Dr Louisa Garrett Anderson (d. 1943), daughter of Elizabeth Garrett Anderson. 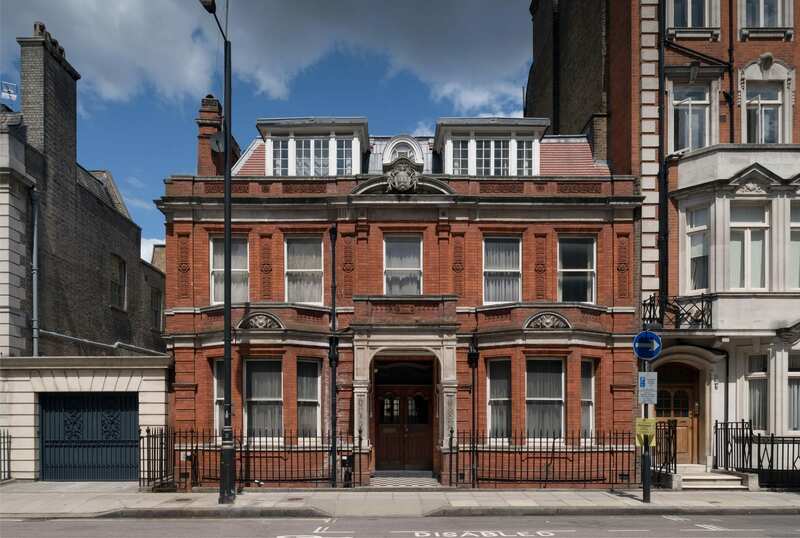 She was in private practice here as well as working at the women’s hospital on Euston Road founded by her mother, whose social reform agenda she shared, establishing a Women’s Tax Resistance League at this house in 1909. Subsequent practitioners at No. 114a included the neurologist and psychotherapist Dr Hugh Crichton-Miller (d. 1951), founder of the Tavistock Clinic. 21 Devonshire Street, of 1855–6, appears to have been the first purpose-built ‘dwarf’ house in the area. It is a simple two-storey box, but with a subtly arranged, stuccoed front incorporating broad relieving arches to the ground-floor fenestration and a bowed central first-floor window. 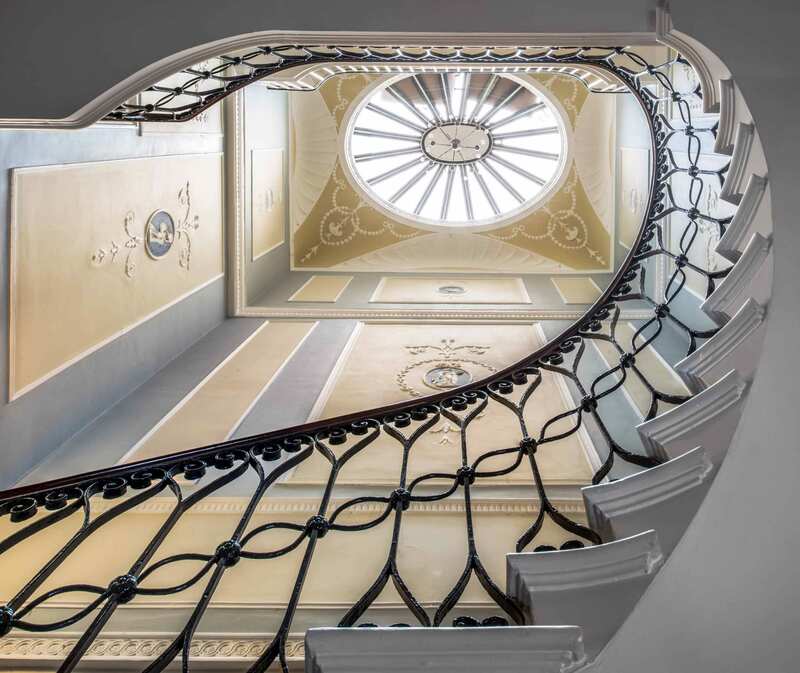 It was a speculation by the Norwich lawyer Merrick Bircham Bircham, who had recently taken on the lease of 117 and 117a Harley Street, in whose grounds it was built. 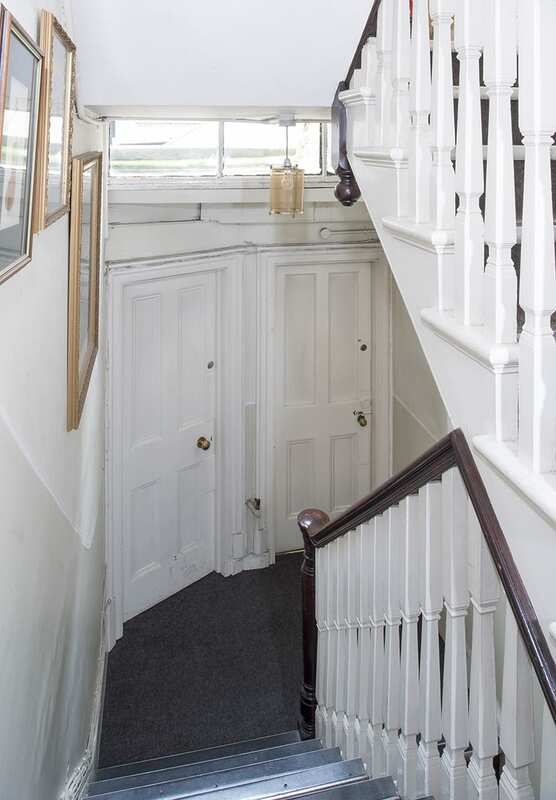 But Bircham’s lease referred to it as a ‘dwelling and studio’, so it is possible that it was purpose-built for its first resident, the sculptor Joseph Durham, who lived here from 1856 until his death in 1877. Many of Durham’s best-known works would have been modelled here, including his monument to the Great Exhibition (unveiled 1863), now outside the Albert Hall. 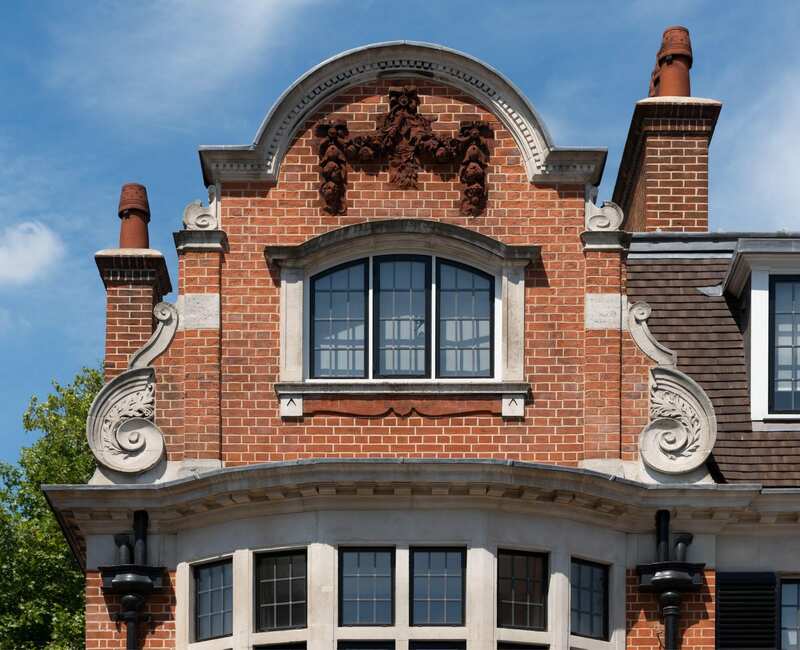 The iron-and-glass canopy to the entrance is an addition of 1910 by Claude Ferrier. 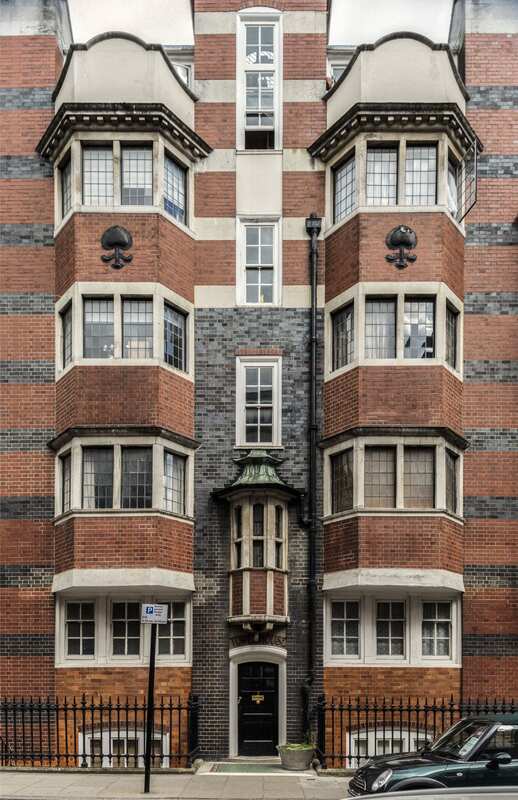 38 Devonshire Street is a double-fronted, red-brick mews corner house of 1902–3, given a neo-Elizabethan twist by double-height bays and heavy, stone-mullioned and transomed windows. The architects were Edward Barclay Hoare and Montague Wheeler. 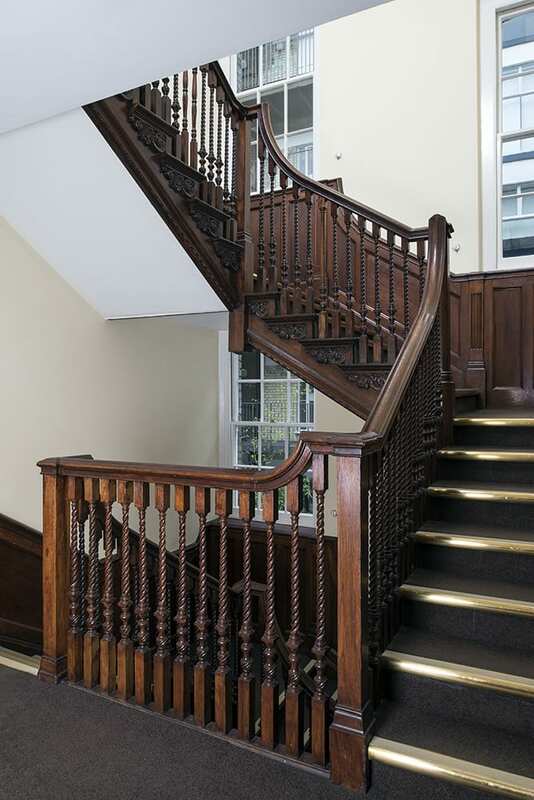 Always in medical use, it was recently refurbished by a private dental practice, who added basement seminar rooms. For over ten years in the 1950s–60s, Stephen Ward, the osteopath at the centre of the Profumo Affair, had his consulting rooms at No. 38. No evidence has come to light to support the repeated claim that his client Lord Astor (who gave him the use of a weekend retreat on the Cliveden Estate) bought the house so that Ward, then in financial difficulties, could continue to occupy it rent-free. There were complaints of noisy female guests in Ward’s apartment many years before the scandal erupted in 1963, by which time he had moved with Christine Keeler to a flat in Wimpole Mews, though he continued to practise at No. 38. 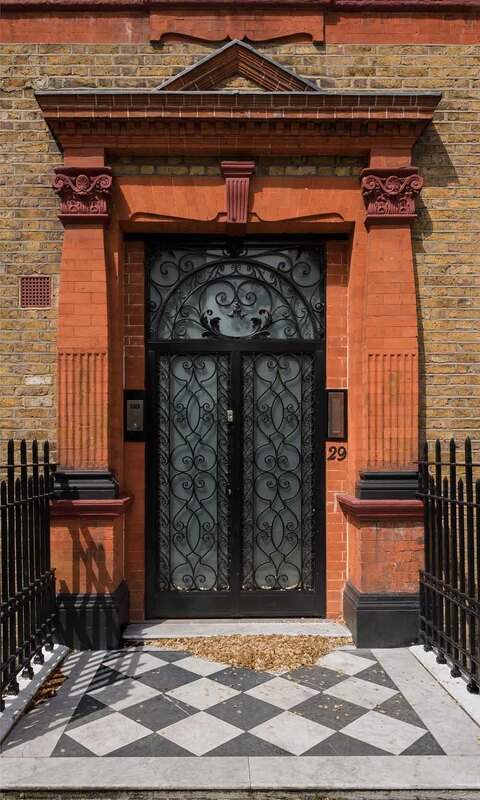 32a Weymouth Street, the first of the area’s late Victorian and Edwardian ‘dwarf’ mews corner houses, was designed by Barrow Emanuel and built in 1886–7 on a site formerly occupied by stabling in Devonshire Mews attached to Nos 90 and 90a Harley Street. Its vernacular Queen Anne Revival style, in red brick with stone dressings, and the two-storey, double-fronted design set the tone for many of the others that followed. 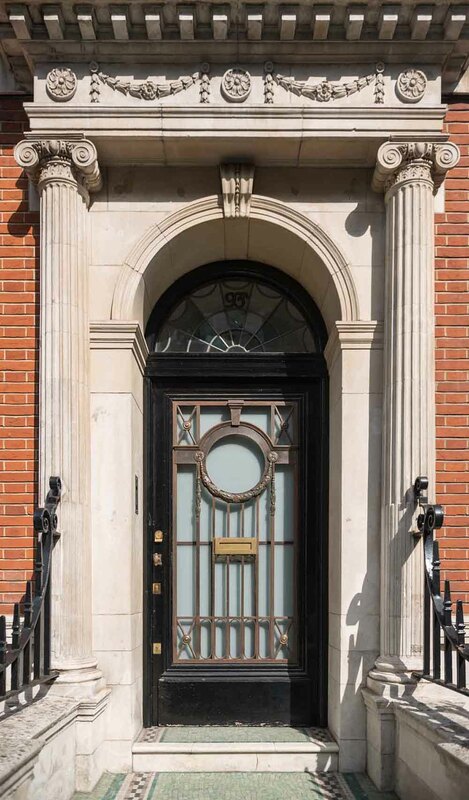 Attractive sunflower panels enliven the brickwork and there are carved arabesques to the stone entrance porch and a small monogram (‘BE’) set into the front wall, commemorating the architect. 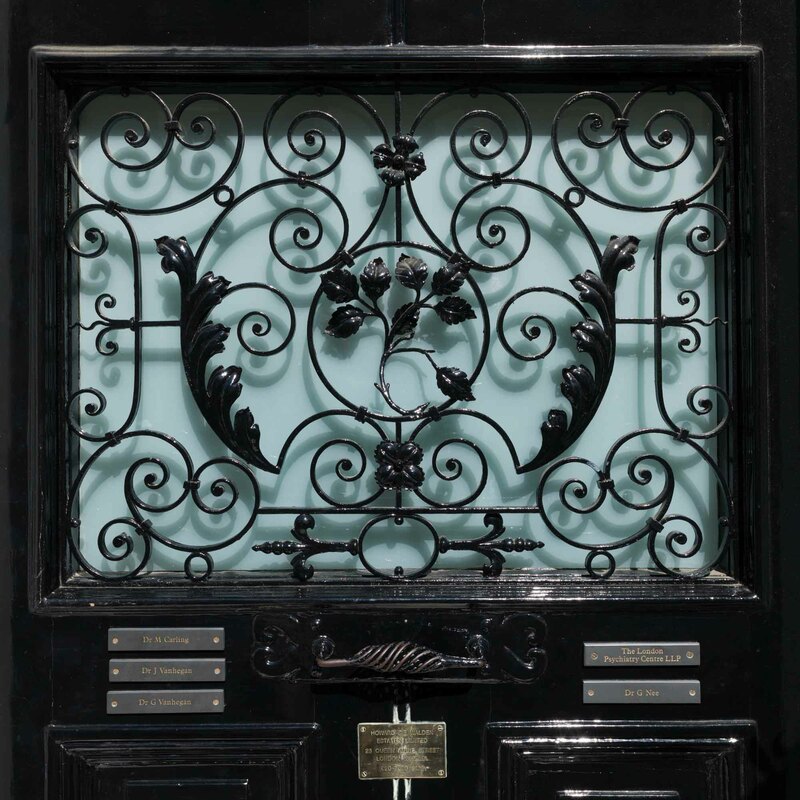 The first residents in the later 1880s and 90s were the cigar importer Arthur Frankau and his wife Julia (née Davis) – better known for her popular novels of London-Jewish life under the pseudonym Frank Danby. 93a Harley Street (Harley Lodge) is another fine example of the double-fronted mews house rebuildings, this time of the early 1900s. Like its dourer stone-fronted equivalent at 90a Harley Street it was designed in 1911 for the developer Charles Peczenick by Sydney Tatchell, but on this occasion in a more playful red-brick and stone neo-Georgian manner, with a degree of asymmetry within the flanking pedimented end bays. In medical use from the beginning, it is now, like many of its type, a private dental surgery. 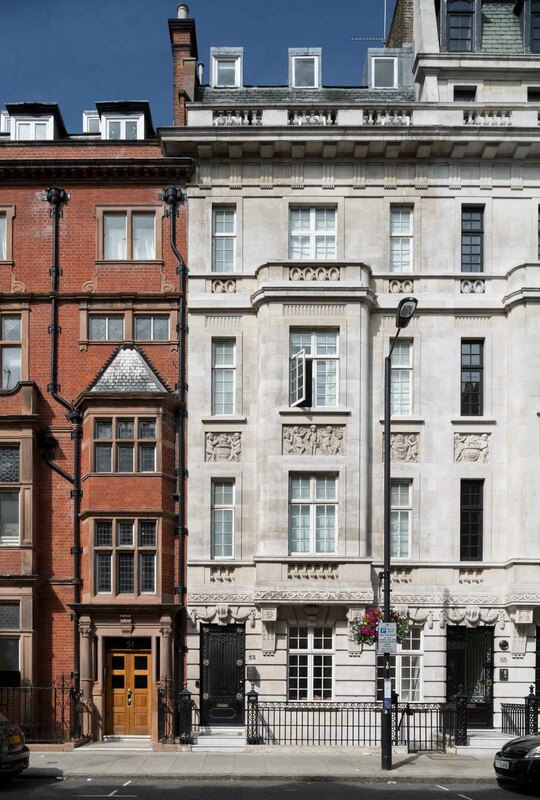 More of a Baroque air attaches to its neighbour of 1908–10 at 1a Upper Wimpole Street, the work of W. Henry White, with its prominent Flemish-looking gables and giant scrolls. 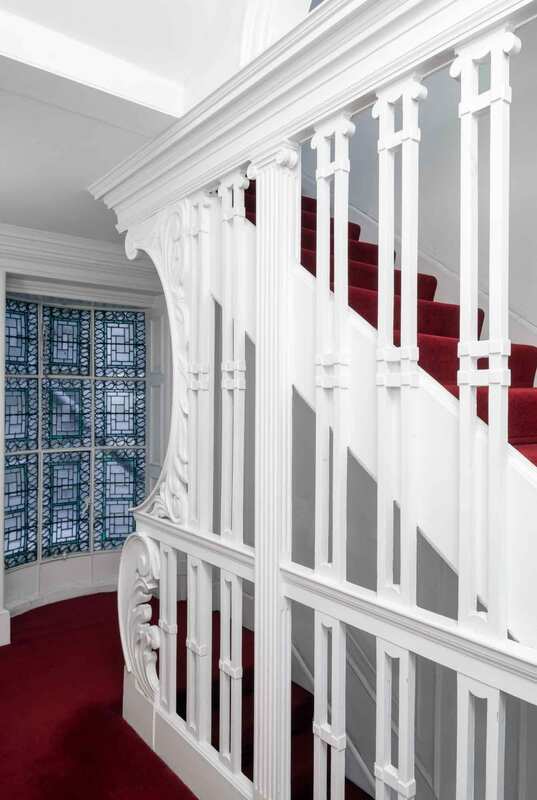 The first-floor window shutters were originally painted green to complement the cherry-red brickwork. The house was a speculation for Samuel Lithgow, the Wimpole Street solicitor and Progressive LCC representative for St Pancras. 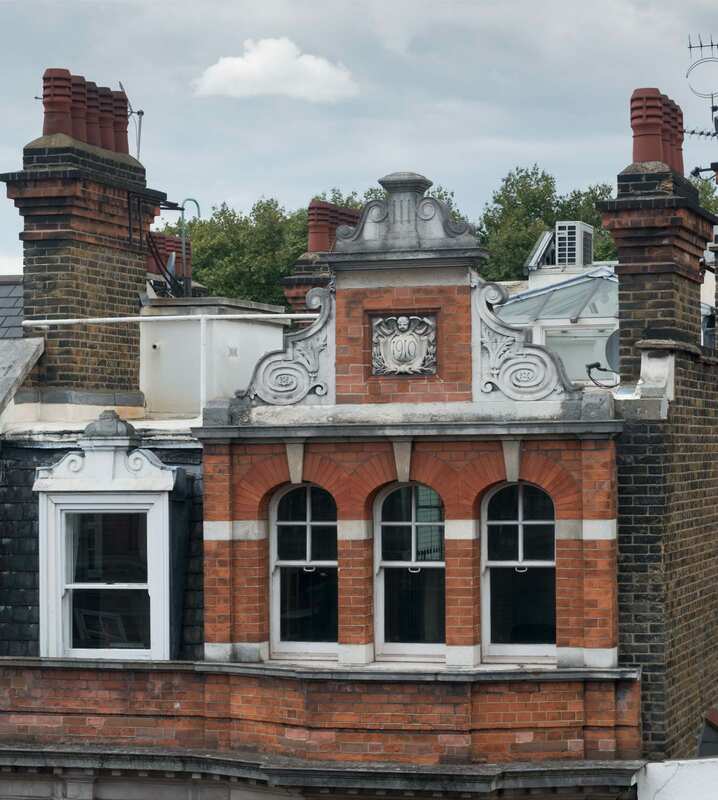 Its first occupant from 1910 until at least 1937 was Peter Lewis Daniel, a senior surgeon at Charing Cross Hospital, who had a private practice here. Having been in medical use for some time, in 2012 the house was the subject of a high-tech conversion to a five-bedroom family home (by Urban Mesh Ltd). 55 New Cavendish Street is another of the area’s characteristic mews-side houses, with its stripey red-brick and stone gables, and bows to the front ground-floor drawing and dining rooms. 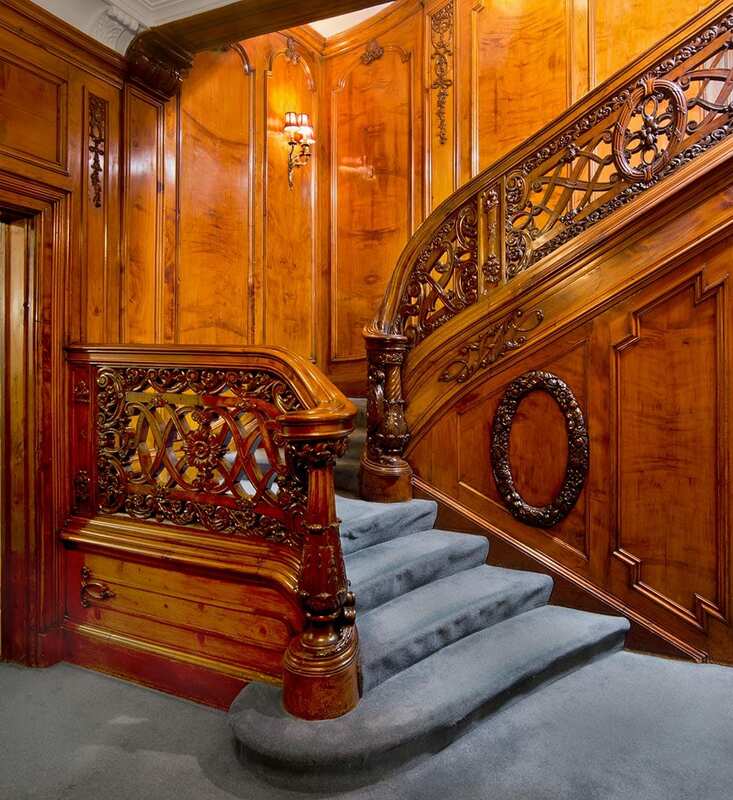 It was built in 1901 to designs by W. Henry White, perhaps reusing an earlier design that he had published in 1888. The developer was the surgeon and cinema pioneer Dr Edmund Distin Maddick. 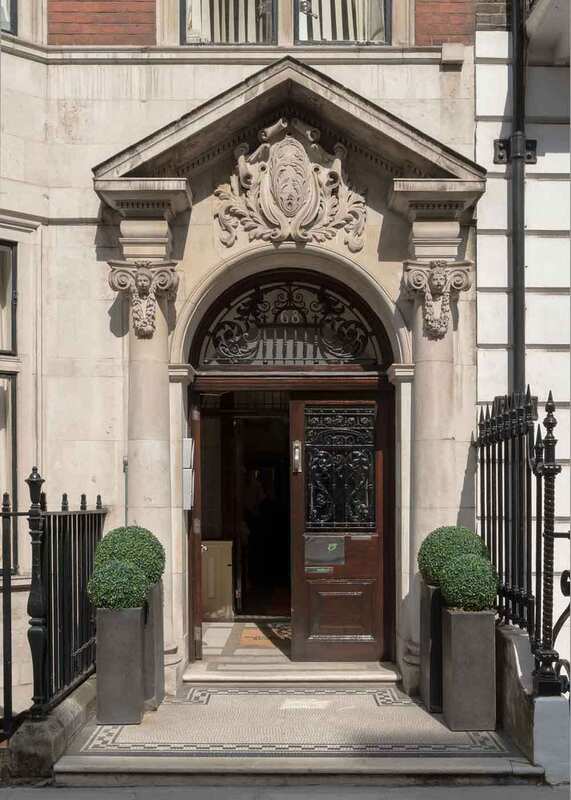 59 New Cavendish Street is a double-fronted ‘dwarf’ house, though here on a more lavish scale, being entirely fronted in Portland stone in a strong Baroque neoclassical style. Set behind a carriage sweep, it has a prominent central entrance porch with a pediment and heavily blocked columns. It was built in 1910 by Kingerlee & Sons to the designs of F. M. Elgood and was another of the speculations in the area funded by the solicitor Samuel Lithgow. The first occupants, there until the 1940s, were Reuben Goldstein Edwards and his wife Edith. He had made a fortune from Edwards’ Harlene hair restorer and colourant. Edith’s philanthropic work later earned her an MBE, and during the First World War their house was given over to the Red Cross Central Workrooms for the production of hospital garments for the wounded. Since the Second World War it has been predominantly in commercial or medical use. 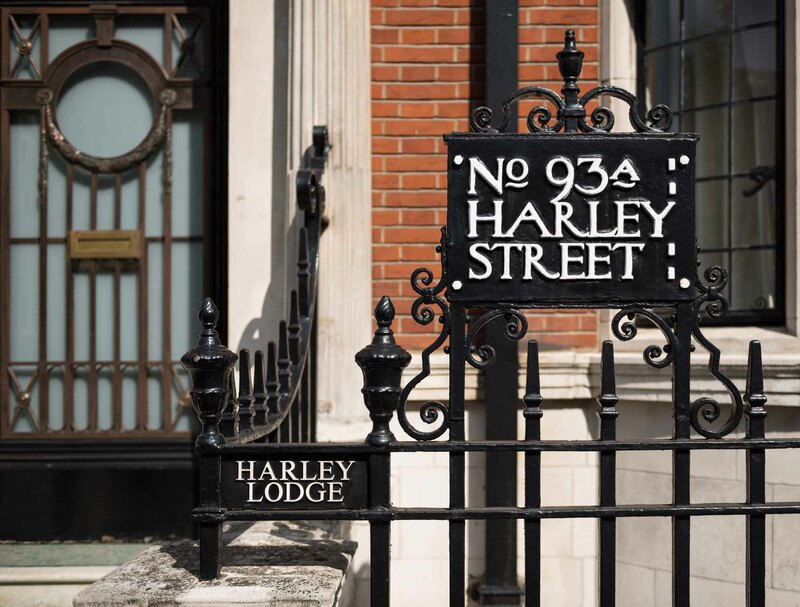 Harley Street has long been synonymous with the top echelon of the medical profession, a Harley Street consultant the apogee of the profession. This reputation was forged in the second half of the nineteenth century, and although it dimmed a little in the years after the Second World War, it enjoyed a resurgence in the late twentieth century with the growth of private health care. The street itself has preserved its residential appearance, despite the fact that for the most part residence is now confined to upper-floor flats. It was first conceived in the early eighteenth century, but largely laid out and built up between the 1750s and 1780s. Although much Georgian fabric remains, there has been considerable rebuilding, particularly in the southern stretches of the street. 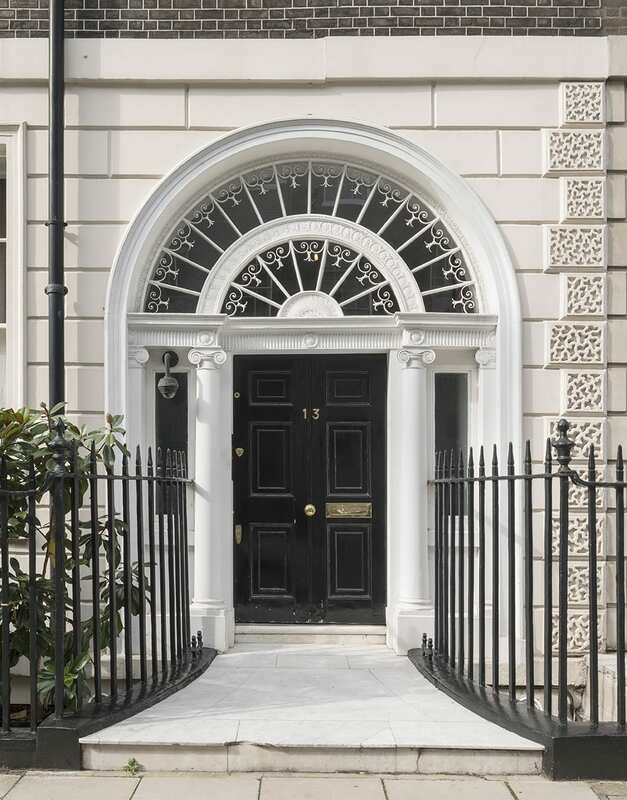 From the beginning Harley Street was one of the more fashionable addresses hereabouts, with aristocracy, gentry, politicians, high-ranking clergymen, military and naval officers resident for the London season. Here too were the portraitist Allan Ramsay, and J. M. W. Turner before he decamped round the corner to Queen Anne Street. Increasingly in the early nineteenth century wealthy merchants took up residence. Many owed their wealth to slavery, from sugar plantations in the colonies and later from the huge sums paid out in compensation to plantation owners following the abolition of the slave trade. 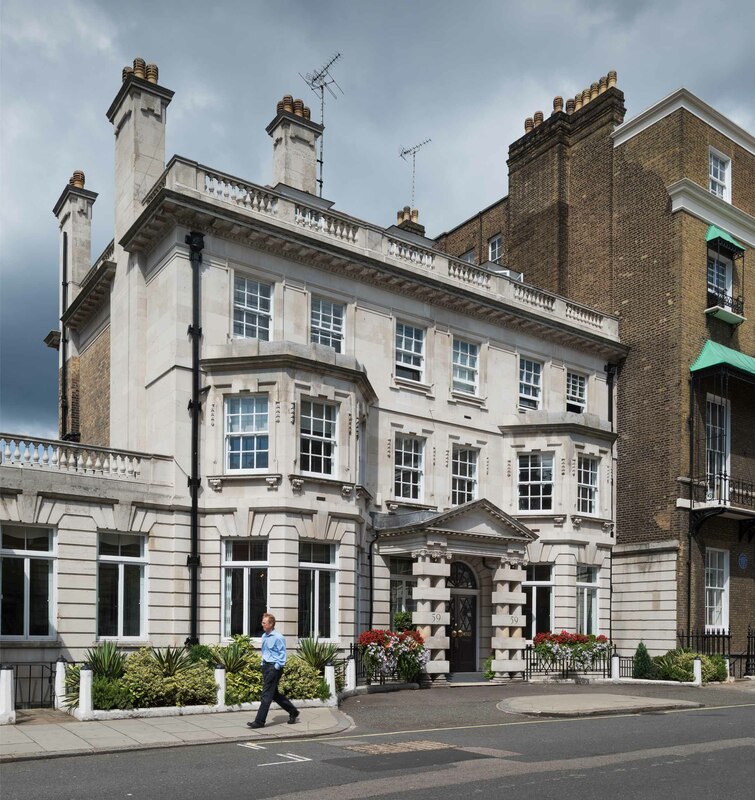 Others had grown rich through the East India Company, so many that Harley Street became as notable for its ‘nabobs’ as it became for its doctors. As late as 1841 Blackwood’s Edinburgh Magazine reckoned that ‘the claret is poor stuff, but Harley Street Madeira has passed into proverb, and nowhere are curries and mulligatawny given in equal style’. During the earlier decades of Victoria’s reign members of parliament and lawyers were prominent in Harley Street. The street so epitomised dull respectability that it was chosen by Charles Dickens as the home of Mr Merdle in Little Dorrit, first published in 1855–7. Disraeli too, in Tancred published in 1847, derided ‘your Gloucester Places, and Baker Streets, and Harley Streets, and Wimpole Streets, and all those flat, dull, spiritless streets, resembling each other like a large family of plain children’. 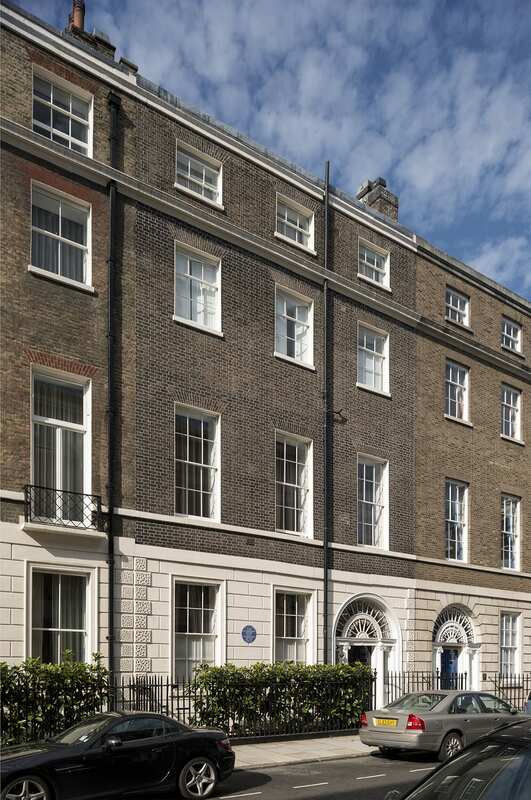 Disraeli’s great political opponent Gladstone occupied 73 Harley Street from 1876–82. His arrival coincided with his campaign on the Eastern Question, arising from the massacre of Orthodox Christians in the Balkans. On a Sunday evening in 1878 a ‘jingo mob’ gathered outside his house, hurling stones and verbal abuse at his windows. By this time Marylebone had long been associated with medicine. Indeed, medicine arrived at the same time as the housing boom of the 1750s onwards. Most of the early evidence relates to institutions for treating the poor. Hospitals, like housing, gravitated to healthy suburban locations close to open fields and fresh air. When the Middlesex Hospital was built on Mortimer street in 1757 it was at the very edge of the expanding city, as was the parish workhouse in Paddington Street. Today, Marylebone generally, and Harley Street in particular, is most closely linked with front-rank medicine and private consultants. From the mid eighteenth century, proximity to London’s teaching hospitals became important for top medical men who held prestigious posts in them. Closeness to aristocratic patients was another major consideration. By the 1840s there were sufficient eminent physicians and surgeons in Cavendish Square and Queen Anne Street to act as a magnet for others. However, around this time those at the top of their profession were as likely to reside south of Oxford Street as north. The medical directory for 1854 shows an even distribution between Marylebone, Mayfair and Bloomsbury. 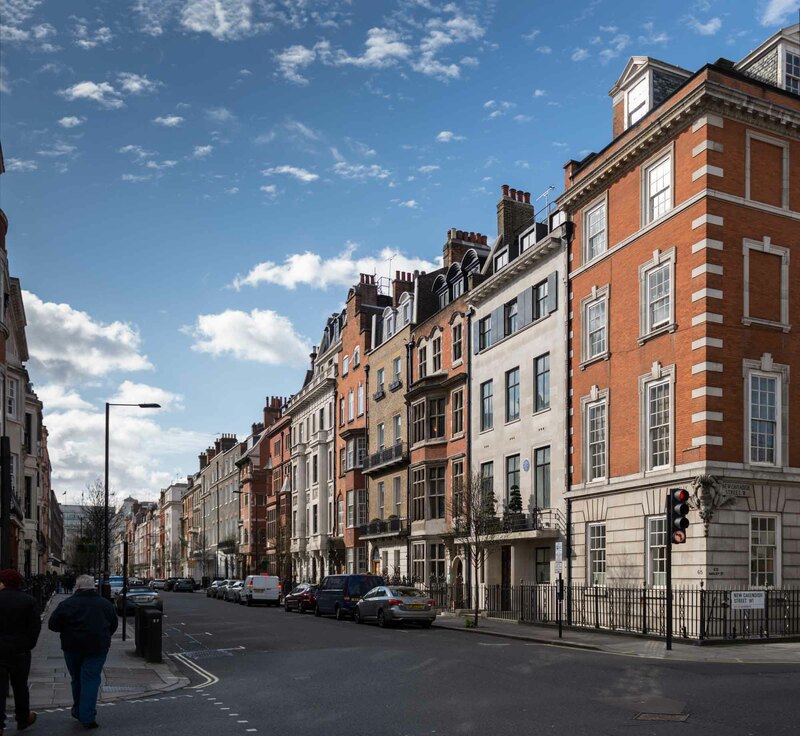 Harley Street’s subsequent primacy is probably accounted for by its immediate proximity to Cavendish Square – the acme of fashionable Marylebone. Even by 1874, when Harley Street’s significance was already established, being close to the square still mattered. In that year Sir Alfred Baring Garrod, physician and gout specialist, moved from 84 Harley Street further south to No. 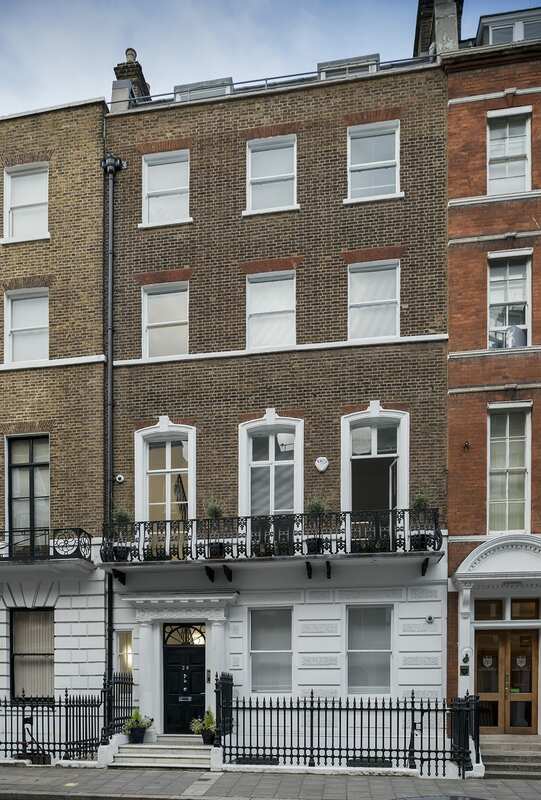 10 simply to be nearer to Cavendish Square. Twelve years later the surgeon Sir John Tweedy’s move in the opposite direction, from No. 24 to No. 100, was regarded by colleagues as committing professional suicide. As fashionable society ebbed away from Marylebone in the late nineteenth and early twentieth centuries, a similar shift of smart medical practice might have been expected, but that never happened. By then many patients of all classes were travelling to see doctors rather than the reverse. But the main reason seems to have been that once a distinct medical community had been established it was found to be enormously beneficial to those within it. This professional interaction is recalled in many memoirs of consultants, who placed great value on the ability to call on the advice or second opinion of a neighbour. In the twentieth century there was also an active policy on the part of the Howard de Walden Estate to preserve the Marylebone grid as a medical enclave. 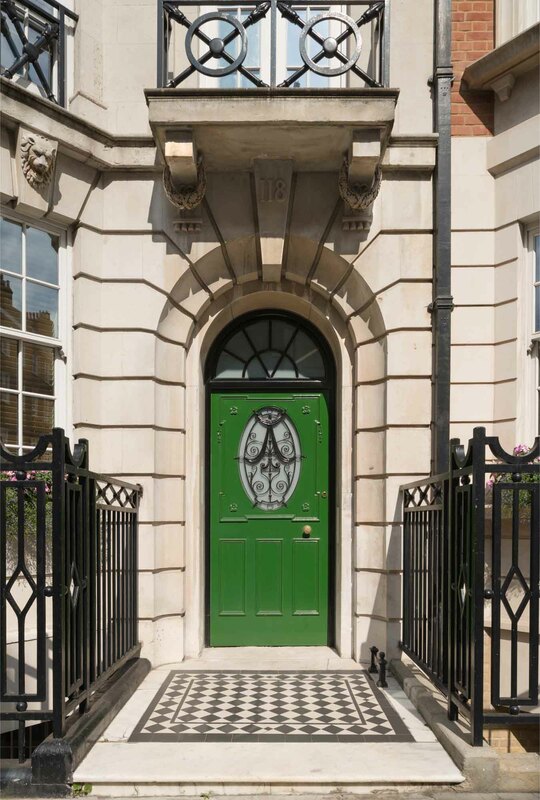 The image of the Harley Street doctor relies much on the traditional kind of premises he inhabited. The standard London town house needed little alteration to turn it into a doctor’s house. Ground-floor front rooms became waiting rooms instead of dining rooms, with a consulting room either immediately behind or in the closet wing. Originally, the doctor’s dependants occupied the remainder of the house above, but after families moved to the suburbs, houses might be converted or rebuilt as suites of consulting rooms for multiple medical occupation. In the later twentieth century many consultants gave up their private rooms for the better-equipped universities and hospitals. In their place came alternative practitioners and aesthetic therapists for whom the individual consulting rooms in elegant domestic settings provided a soothing backdrop. 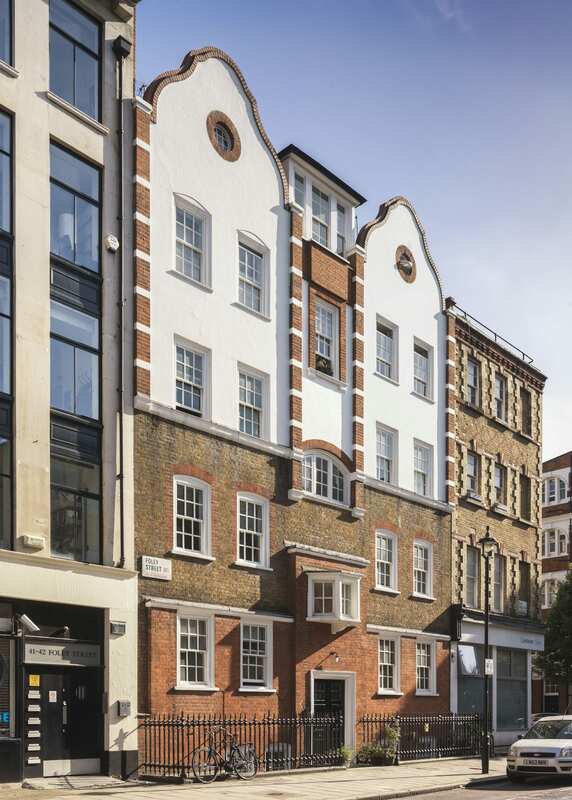 In the latest conversions encouraged by the Howard de Walden Estate there has been a policy of reconstruction to create purpose-built consulting suites over reinforced basements, allowing the latest diagnostic equipment to be installed behind retained facades, which preserve the historic character of the district. 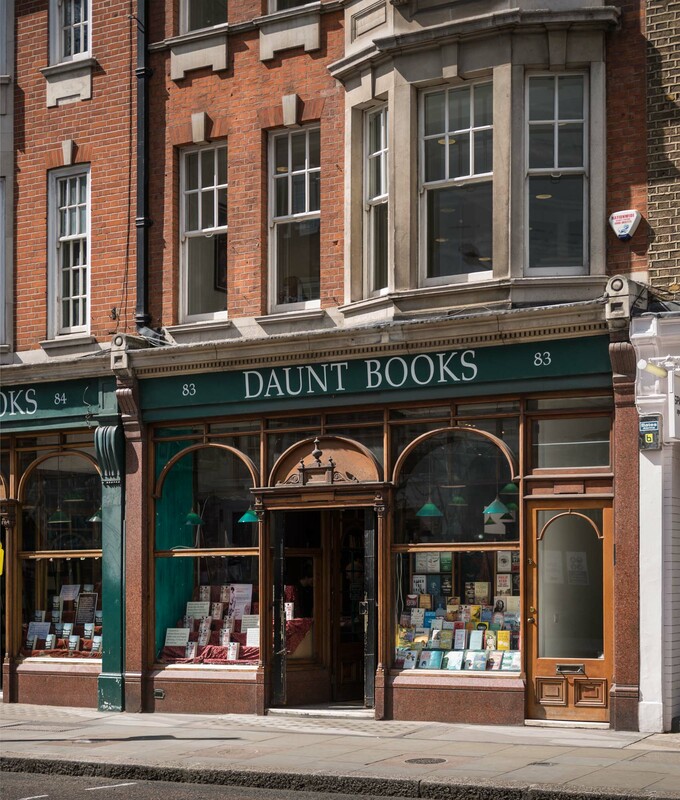 Daunt’s in Marylebone High Street is a favourite destination for book lovers. 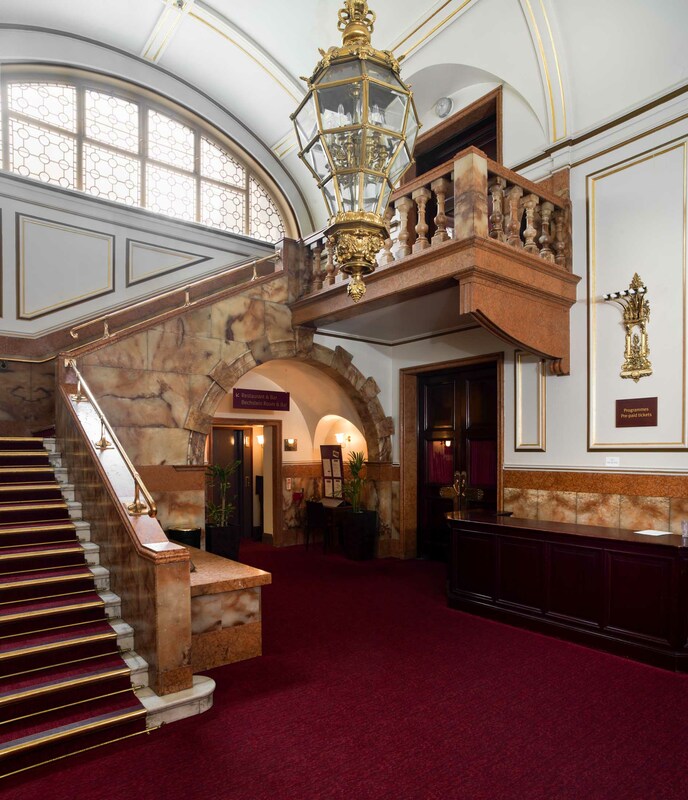 With its top-lit gallery, a remarkable Edwardian survival, it has one of the most distinguished interiors in the country. 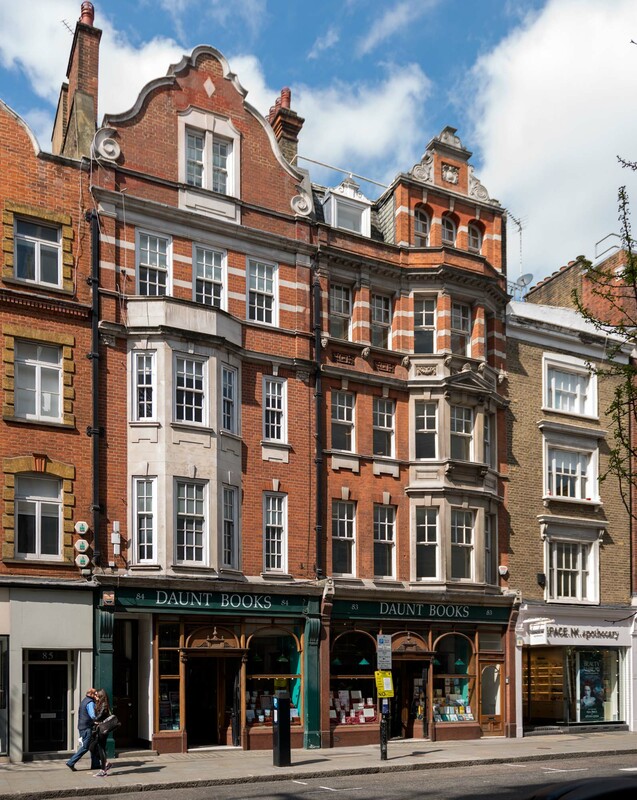 James Daunt took over the premises in 1989–90, initially specializing in travel books, and expanded into the next-door shop in 1999. But there had been a bookshop here since 1860. At that time it was in the hands of Francis Edwards. He had married in 1855 Sarah Anne Stockley whose father, Gilkes Stockley, was a bookseller with a shop in Great Quebec Street near Portman Square. After the marriage, Edwards took over Stockley’s business and five years later, with a growing family, moved to the High Street. He took the lease of what was then No. 83A. It became No. 83, as it is now, in 1927 (until then the present 83A was No. 83). The High Street as it developed during the late eighteenth and nineteenth centuries was as mixed in shopping and business character as any London high street. In the early 1830s Thomas Smith, in his invaluable Topographical and Historical Account of St. Mary-le-Bone, summed up its humdrum character in a single sentence: ‘The houses have nothing to recommend them in point of architectural beauty, being plain brick buildings; and from their having been built at various periods are destitute of uniformity; they are, however, principally occupied by respectable tradesmen’. There was some small-scale mid Victorian rebuilding of shops and public houses as leases expired, but nothing to alter radically the look of the street until the late nineteenth century when the Portland (later Howard de Walden) Estate began a systematic policy of complete rebuilding as the condition for renewing old leases. 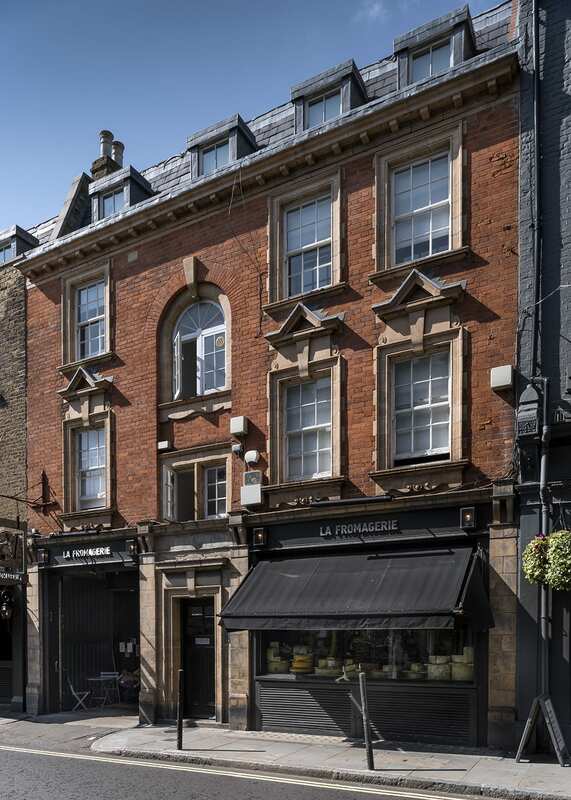 When Edwards moved to the High Street it was to a late eighteenth-century building, although the neighbouring premises to the north (the present 83A) had been rebuilt the year before. 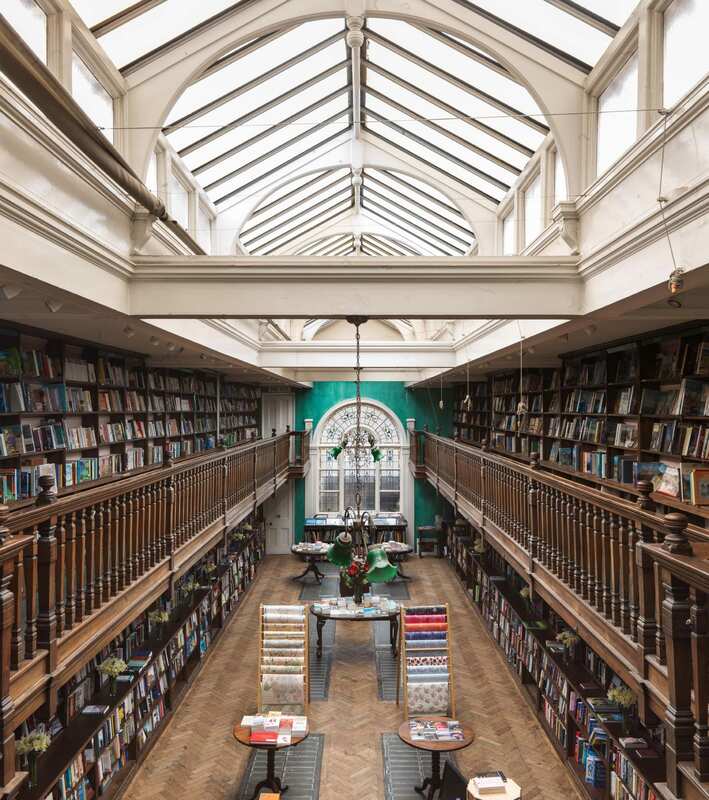 Originally specializing in theology, the shop expanded under the management of Francis’s son, also Francis, to become one of the country’s leading antiquarian bookshops. Theology gradually gave way to a new emphasis on travel, topography and maps. Business evidently thrived, as Edwards embarked on a no-expense-spared rebuilding in 1908. By that time the family was no longer living over the shop, having moved out to the London suburbs, first to Ruislip and then to Northwood. Edwards chose W. Henry White as his architect, among the best of a handful of architects regularly employed on rebuilding schemes on the estate around this time. At the same time White also designed No. 84, the adjoining property to the south, in a similar vein, and a few years earlier had designed Nos 70 and 71 (built in 1903–4). 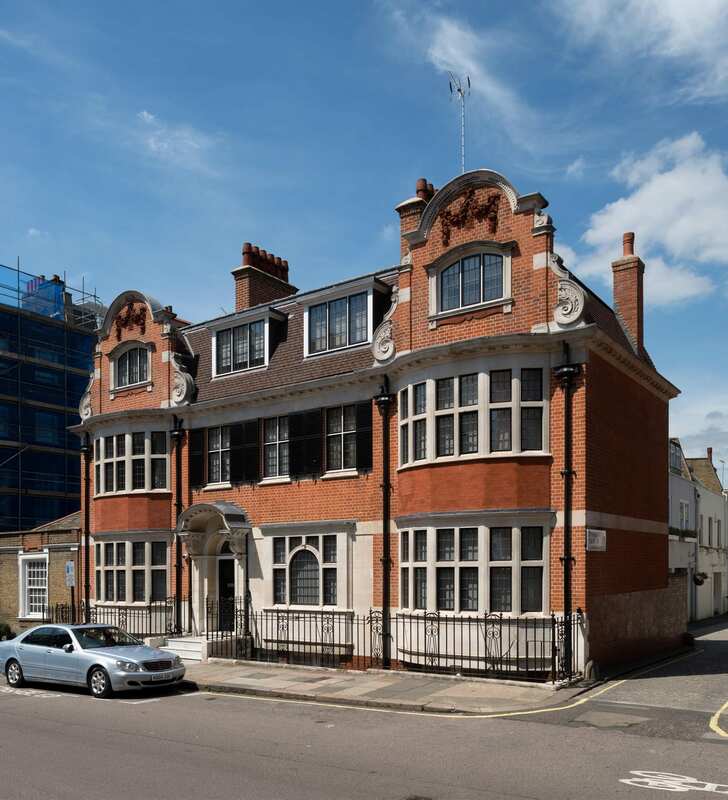 Nos 83 and 84 are an unmatched pair in red brick with plentiful stone dressings topped off by shaped gables, in the commercial Queen Anne style favoured by the Estate. The date 1910 can be seen on a shield above the three arched windows lighting the attic of No. 83. The elegant shopfront with its central doorway flanked by large plate-glass display windows also has a side entrance providing access to the upper floors, all framed by pink granite piers and stall risers. Francis Edwards died in 1944, but the shop remained in the family until the late 1970s. 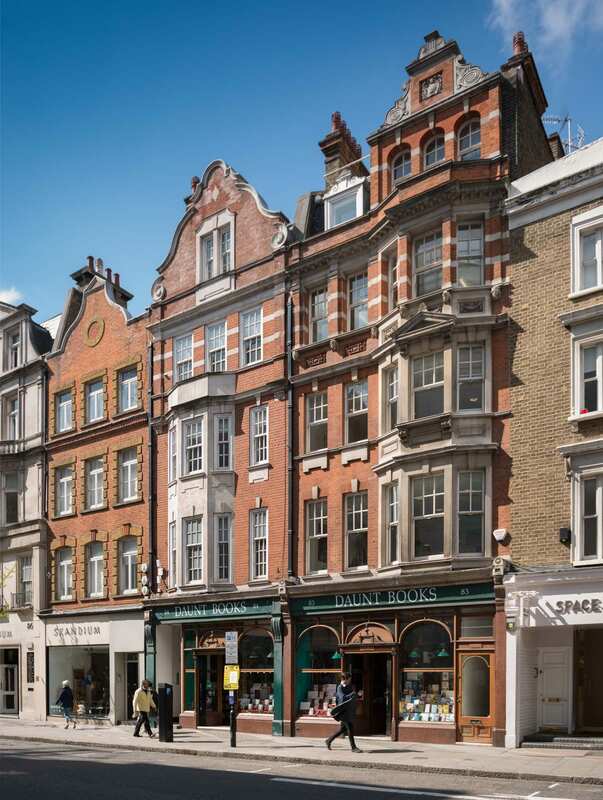 The business was subsequently bought by Pharos Books in 1982 and the shop was briefly known as Read’s of Marylebone High Street. Francis Edwards still exists as an antiquarian bookseller’s, with premises at Hay-on-Wye and in Charing Cross Road. 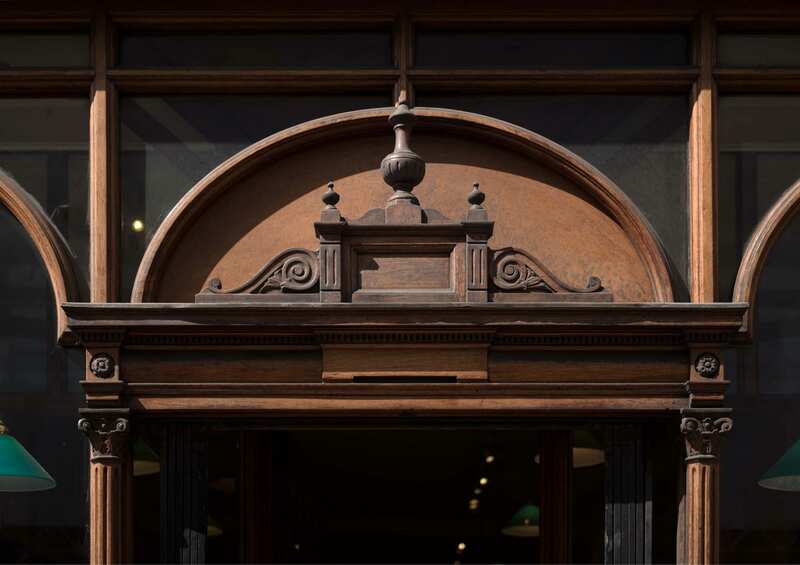 Pediment over the entrance to Daunt Books, 83 Marylebone High Street. Photographed by Chris Redgrave © Historic England. The recent series of Who Do You Think You Are, featuring Charles Dance noted that Dance’s ancestors the Futvoyes had an art shop at No. 83 High Street in the early nineteenth century, and the Howard de Walden archive shows that Charles Futvoye was granted a lease of No. 83 in 1819. This was, however, not on the site of the present No. 83. It may have been the present 83A, or a house further to the north, long since rebuilt. South-east Marylebone is the home of the University of Westminster, founded in 1992. 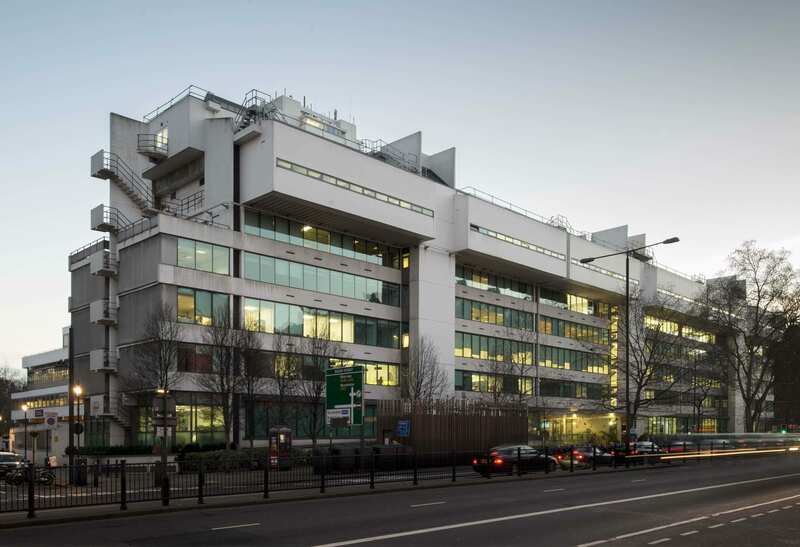 Though dispersed, its four main sites were inherited by the new university from the Regent Street Polytechnic via the Polytechnic of Central London (1970–92) and were purpose-built at various stages in that institution’s development. Whilst the Regent Street site goes back to the 1830s and the Little Titchfield Street site to the 1920s; the New Cavendish Street and Marylebone Road sites, planned simultaneously, are consequences of the great expansion of British higher education facilities in the 1960s, when the purposes of polytechnics were being reviewed and enlarged. The science and engineering buildings in New Cavendish Street were farmed out to private architects in 1962, but the task of building the reformed polytechnic’s other two new faculties on the former Marylebone Workhouse or Luxborough Lodge site, was left to the LCC’s in-house staff. 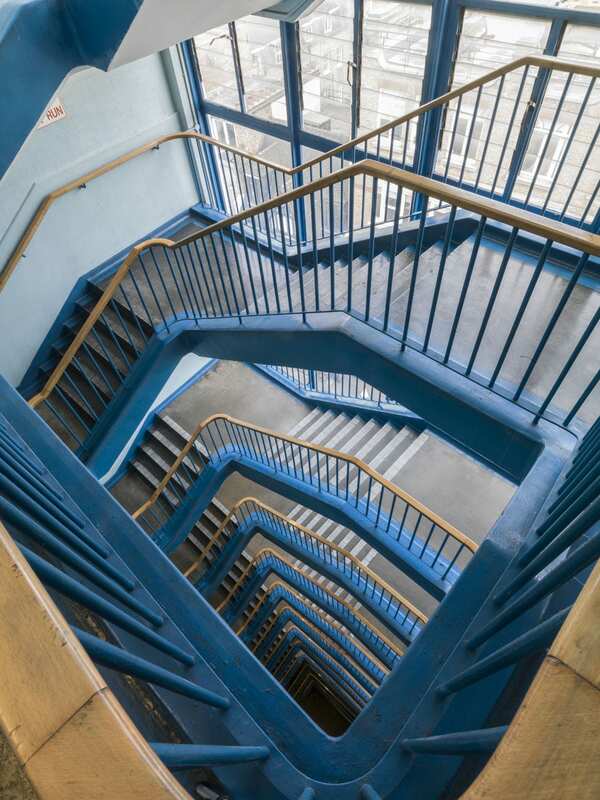 By the time this even grander project started on site, the LCC had become the Greater London Council and its education powers for central London had passed to the Inner London Education Authority. So the official credits for the buildings as erected in 1966–70 were as follows: designers, the GLC Architect’s Department, Education Section, with Michael Powell as chief education architect, Ron Ringshall as job architect and Frank Kinder and J. Buckrell as principal assistants; builders, Taylor Woodrow Ltd; client, the ILEA on behalf of Regent Street Polytechnic, from 1970 the Polytechnic of Central London. 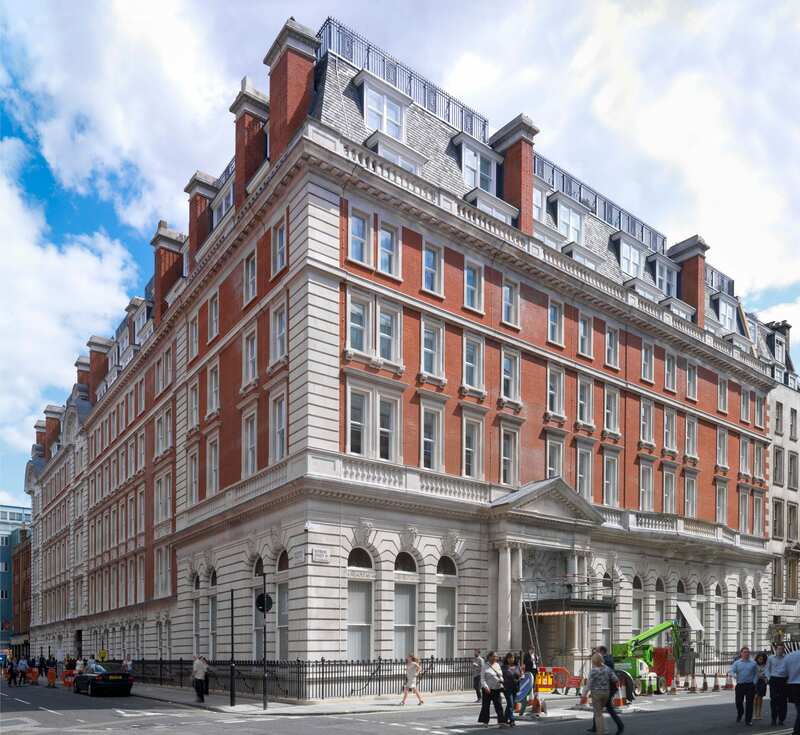 The nearly four-acre site consisted of an extensive frontage to Marylebone Road, with a fair depth of land behind accessible on the east from Luxborough Street. It dropped down at the back, tapering slightly towards Paddington Street Gardens. The southernmost portion, furthest from the noisy main road, was reserved for the public housing that the LCC politicians had insisted must form part of the redevelopment. This was conceived as a single tower block (Luxborough Tower), standing directly behind a thinner second tower to its north designated as a student hall of residence. 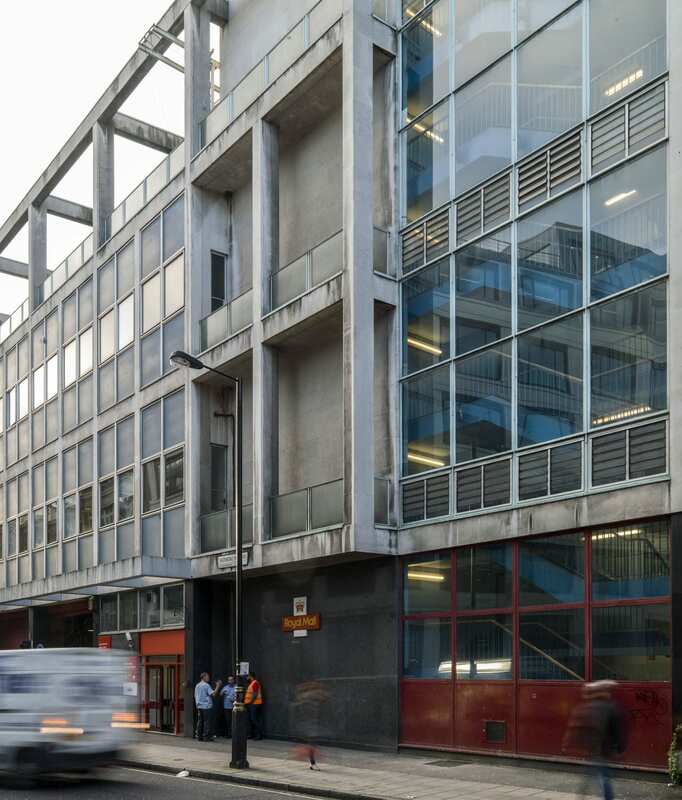 The educational buildings were divided by the architects into three, all set over a continuous concrete podium 3ft above Marylebone Road, allowing a deep basement at the back where ground levels were lower. The main road frontage was entirely taken up by a long, linear teaching building, reserved in the first place for the college of architecture and advanced building technology. At a central point the lower storeys of this monumental frontispiece opened up into a courtyard, backed by a T-shaped building dedicated to communal and service facilities of various kinds ranging from lecture theatres and a library to engineering construction halls underneath. The third element, the college of management, occupied a simple north–south block parallel to the western boundary, defined by the rear of flats in Chiltern Street. These latter blocks were linked by covered ways at first-floor level to the student hostel at the back, which comprised 178 study-bedrooms and 40 larger bed-sitting rooms for management students – many of whom were expected to be mature, short-course students on release from industry. Under the lee of the T-shaped block and facing Luxborough Street an extra single-storey building was slipped in, a local office for district surveyors. The setting of these separate elements round paved open space, sturdily shielded from the main road, offered the Polytechnic a campus air it had not previously enjoyed. On the other hand the frontage itself struck an urban and triumphalist note, not rare in public-sector architecture of the 1960s. The concept was of a concrete megastructure, forceful enough to command attention on a major traffic artery, articulated by insistent horizontals for the accommodation against verticals for the circulation, bristling with expressed escape stairs at the two ends, and crowned by a hefty overhang along its full length. The priority given to the overhang, which straddles both sides of the front building, was symbolic, for here were located the architectural studios. The teaching of architecture had been to the fore throughout the pre-planning process. The section of these rooftop studios, taking up the fifth to seventh floors, therefore received the designers’ best attention; along each of the frontage’s four divisions between the circulation towers and stairs ran three interconnected levels, with spaces of differing length, width and height, and sundry provisions for side and top lighting. Unlike the New Cavendish Street spaces, they were neither double-glazed nor mechanically ventilated, and so were subject to road noise and pollution. 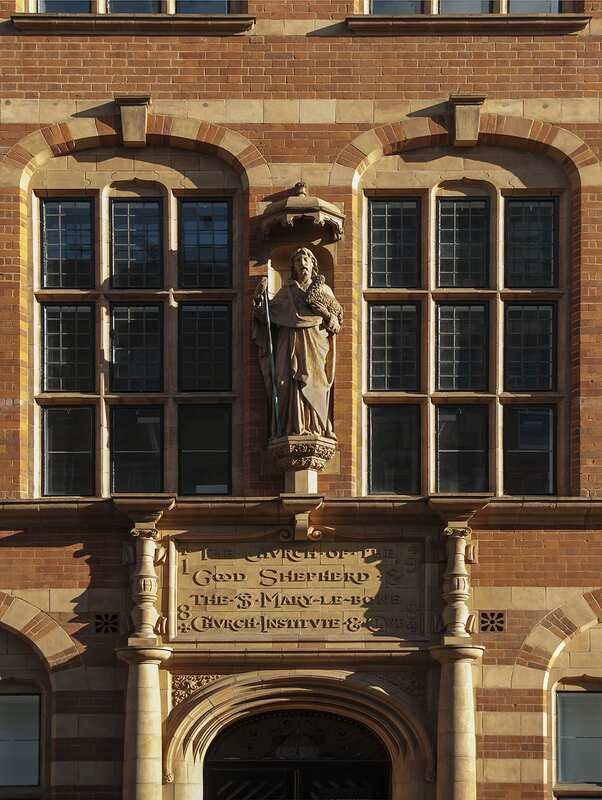 Marylebone Road had been first conceived as a monument to the integration of construction skills; the grandiose title ‘College of Architecture and Advanced Building Technology’, which survived till the opening, reflected that. But the removal of science and much of engineering from the project and the substitution of management studies undermined that technocratic purpose. 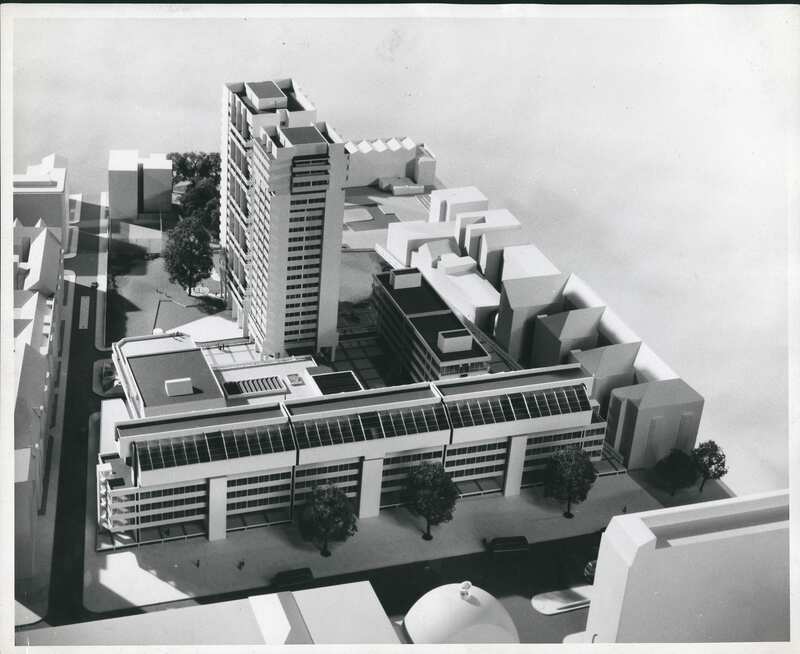 The whole vision of a superschool in construction – a ‘National College of Architecture’ – was already fading when the LCC became the GLC in 1965, and was to vanish entirely as the public sector lost glamour. Certainly the facilities which the Regent Street Polytechnic’s School of Architecture inherited when it moved to Marylebone Road in 1970 were far superior to those it had enjoyed in Little Titchfield Street; it was probably the best equipped such school in Britain. But the final organization and remit of the college of architecture remained unsettled till the last moment, and left critics with a sense of fragmentation rather than the promised integration. Already it was being hinted at the time of the opening that polytechnic schools of architecture and construction had failed to differentiate themselves from their university counterparts, except by the lower pay of their staff. Since 1970 the site has seen both diversification and intensification of use. 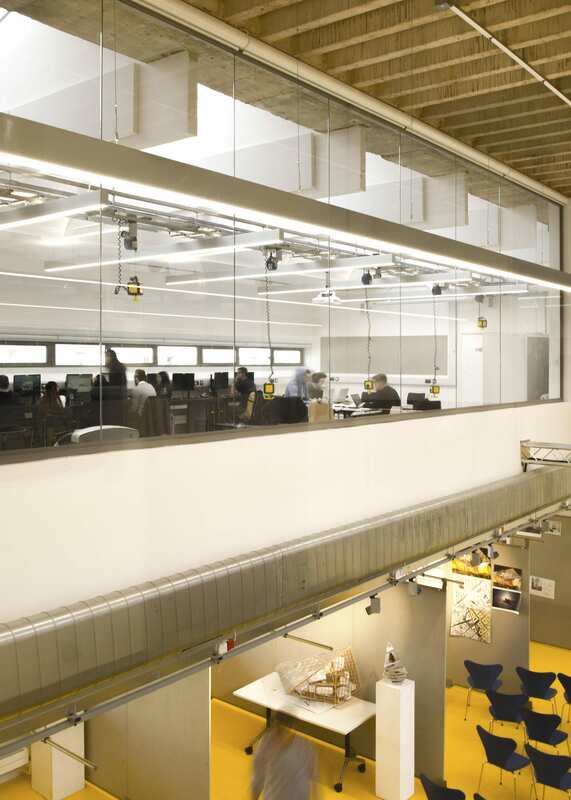 Architecture, construction and management are now among many topics taught at Marylebone Road under the University of Westminster, and the buildings have been several times altered and expanded to accommodate the various changes. The permeable front and paved court have disappeared, leaving very little of the site open to the elements. 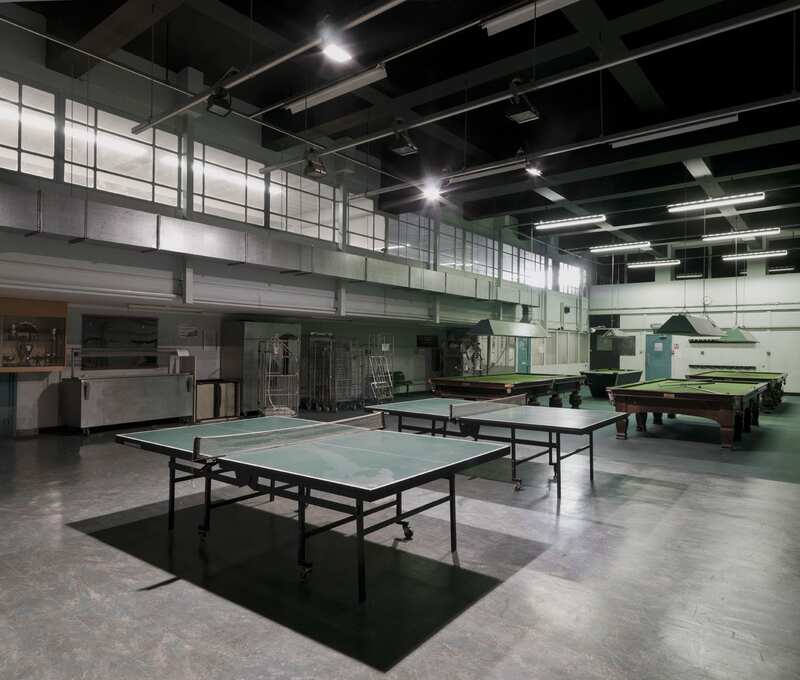 The most significant such changes were the infilling of the entrance void and erection of a canopy in 2002 by Dannatt, Johnson Architects, and their creation of the Hogg Lecture Theatre in the back block. 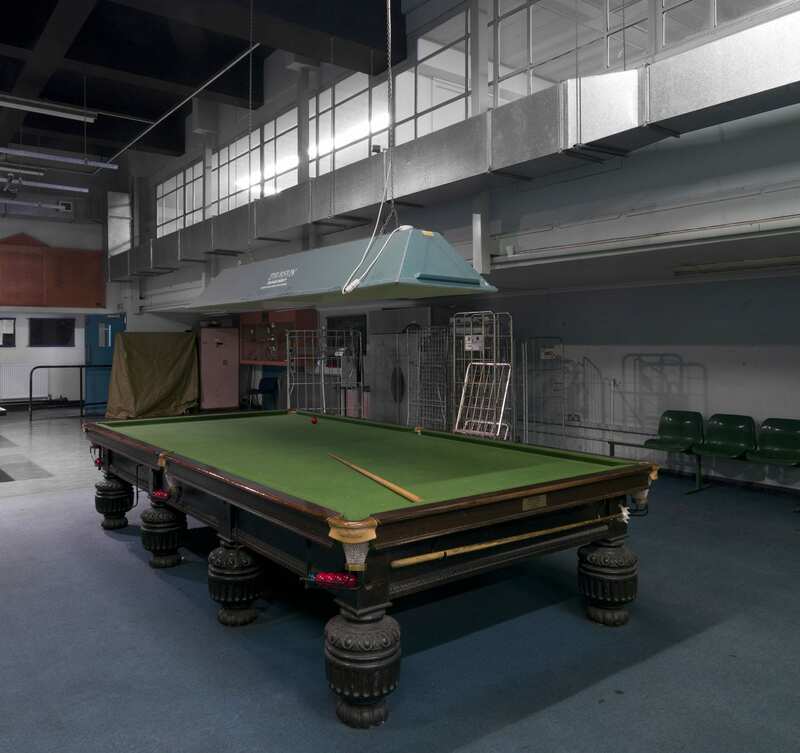 This was followed in 2012 by a large-scale refurbishment by GM Rock Townsend, architects, which fully-roofed the open courtyard to create a new informal social learning space. 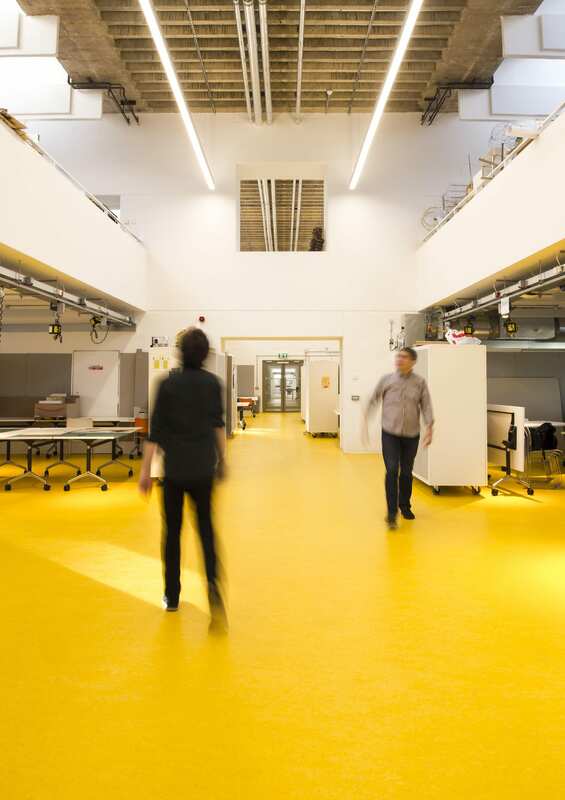 Blighted by insensitive partitioning and subdivisions accumulated over the years, the open-plan layout of the architecture studios on the fourth and fifth floors was reinstated in 2015 by Jestico+Whiles, architects. Architect’s Journal, 2 June 1971, pp. 1245–64. This, the second of our postal posts, is a complement to the story of the East London Mail Centre published here on 11 November 2016 with its mention of the narrow-gauge Post Office Underground Railway or ‘Mail Rail’. 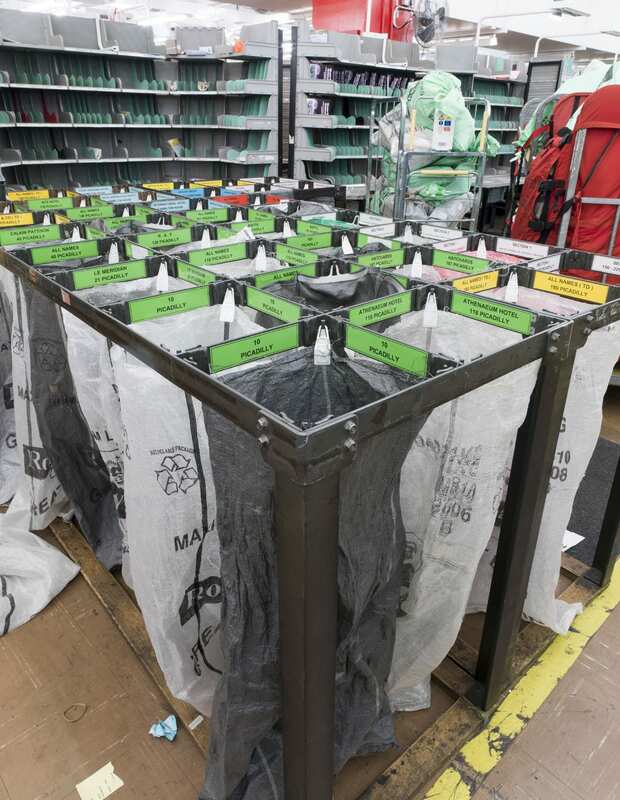 Since then, in July 2017, a section of Mail Rail has been restored to use and opened to the public at the Postal Museum at Mount Pleasant (see www.postalmuseum.org). This railway was a mail-transport line that connected Whitechapel to Paddington. Tunnels at a shallow depth (averaging around 70ft) and 9ft in diameter were built by John Mowlem and Company in 1914–17, though the tracks were not laid and equipment fitted until 1924–7 for what opened as the world’s first driverless electric railway. 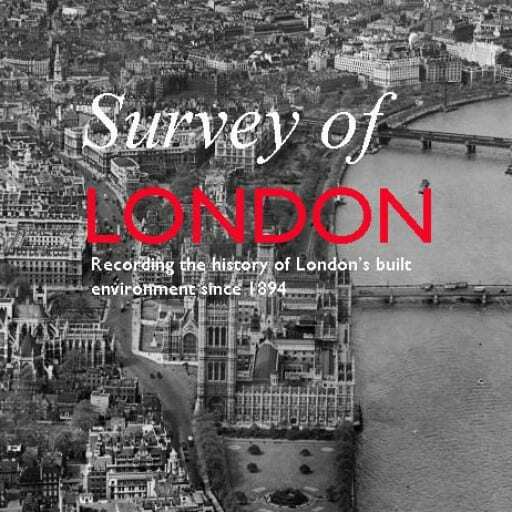 Another aspect of the line’s history relates to a site in south-east Marylebone, the area that is covered in the Survey of London’s forthcoming volumes 51 and 52, set for publication in late 2017. A site immediately above the mail-transport line in the West End, on the west side of Rathbone Place, suffered significant Second World War bomb damage. Despite the railway the Post Office faced growing problems with access and loading at its West End offices (Western Central District Office, New Oxford Street: Western District Office, Wimpole Street; and Western District Parcels Office, Bird Street). This was said after the war to pose ‘the worst postal accommodation problem in the country’.1 It led to a decision to replace the last two depots and their underground stations with a new Western District Office at Rathbone Place. The site was designated for compulsory acquisition to this end in the London County Council’s Development Plan of 1952, and passage of the Post Office Site and Railway Bill in 1954 enabled the purchase of 2.3 acres, in the event voluntary. With Sir William Halcrow & Partners as engineers the railway was expensively diverted from a diagonal south-east to north-west path across the site to take on an east–west line for a station with two platforms square to the intended building. The cut-and-cover underground works were carried out in 1956–9. Elbow room thus gained permitted a facility less like a Tube station than the line’s earlier stops. 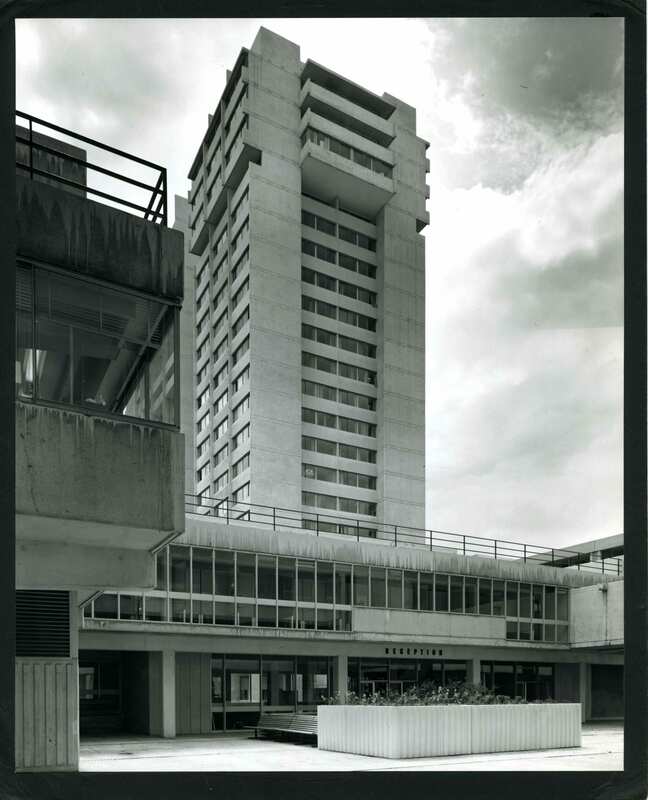 Designs for the building above were reworked in 1960 by Alan Dumble, a senior architect in the Ministry of Works. Its first, in the event only, eastern phase was largely up by 1963. The new Western District Office was opened on 3 August 1965 by the Postmaster General, Anthony Wedgwood (Tony) Benn. On the long Rathbone Place frontage the building’s concrete frame was expressed in a 28-bay grid between Portland stone-faced stair towers. The fourth storey was set back leaving the structural frame as openwork. Along the pavement, mural artwork was intended but never made. A plan to extend westwards, also not seen through, meant that the utilitarian rear elevation was left starkly open to view from Newman Street behind a large parking yard. Here art did eventually arrive – the flank wall of 15 Newman Street facing the Post Office yard, and Oxford Street beyond, was the site of Banksy’s ‘One Nation Under CCTV’ mural of 2008. 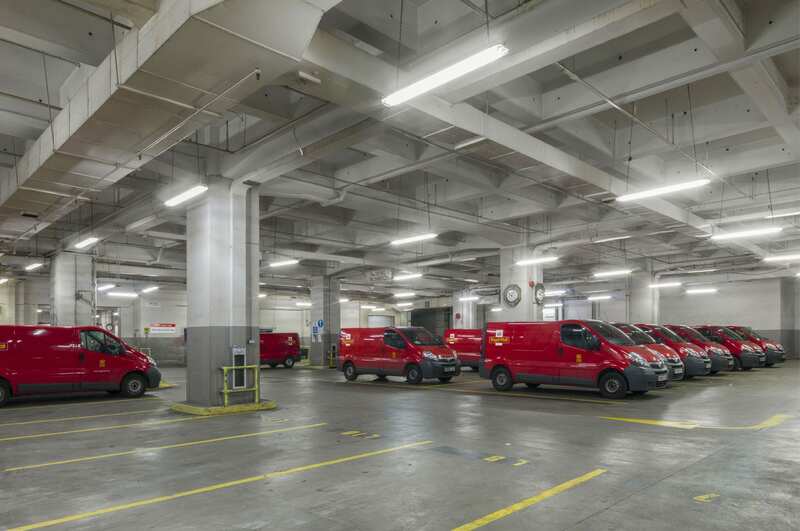 Inside the post office a ramp led to a basement with parking for vans above the railway station. When new this was among the most mechanized post offices in Europe, with chain conveyors in the upper-storey sorting halls and spiral chutes to despatch mail down to the railway. 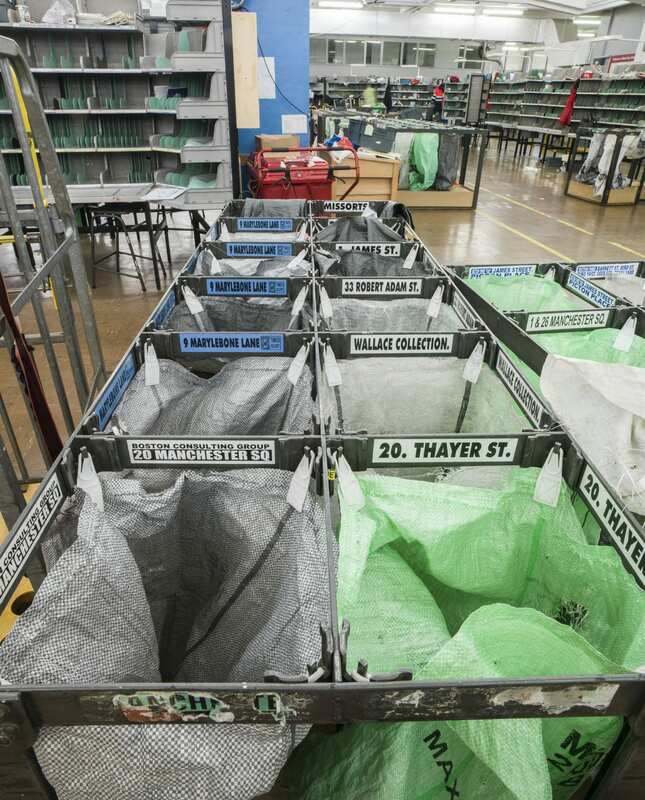 Its opening coincided with the introduction of post codes and the use of electromechanical sorting machines. The fourth floor housed a canteen and other facilities for staff who numbered more than a thousand. A reconfiguration in 1974–6 provided a bar, games room and lounge, and incorporated stained glass and war memorials from antecedent post offices. 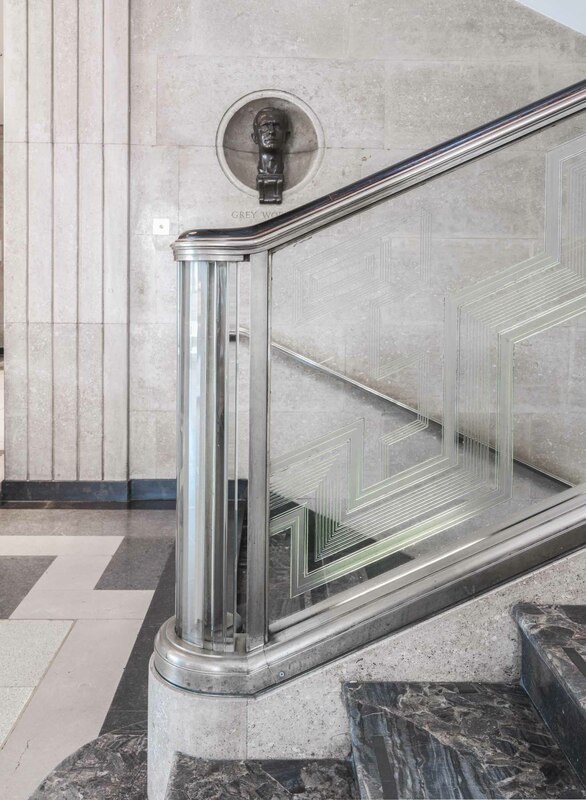 A small aedicular Ionic War Memorial of c.1920, transferred from the Wimpole Street office, faced Rathbone Place from 1981 to 2013. The railway closed in 2003 by which time staff numbers had begun a steep decline justified by decreases in demand for the post. 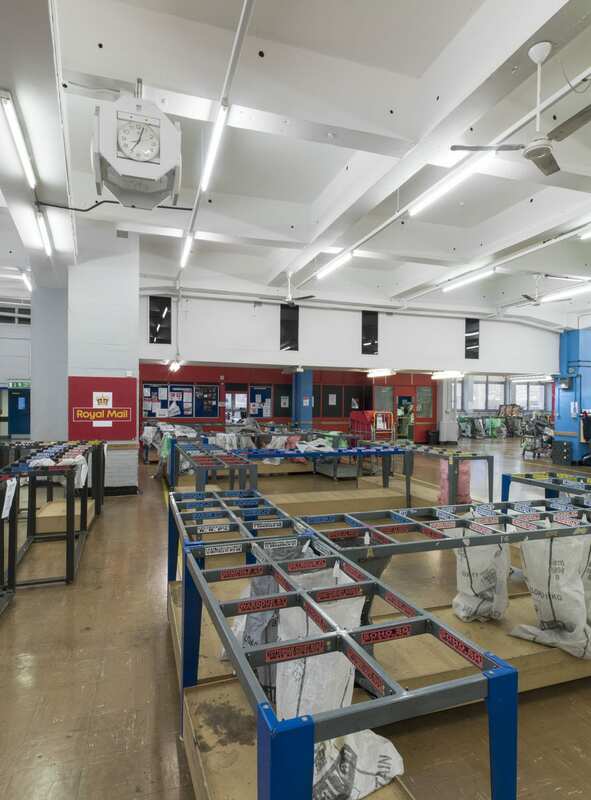 Remaining postal services in what had become the West End Delivery Centre relocated to Mount Pleasant in 2013. This shift had been long in the planning and in 2011 the Royal Mail Group with PLP Architecture had proposed redevelopment of the whole site as ‘Newman Place’, offices, shops and housing with a diagonal pedestrian throughway. 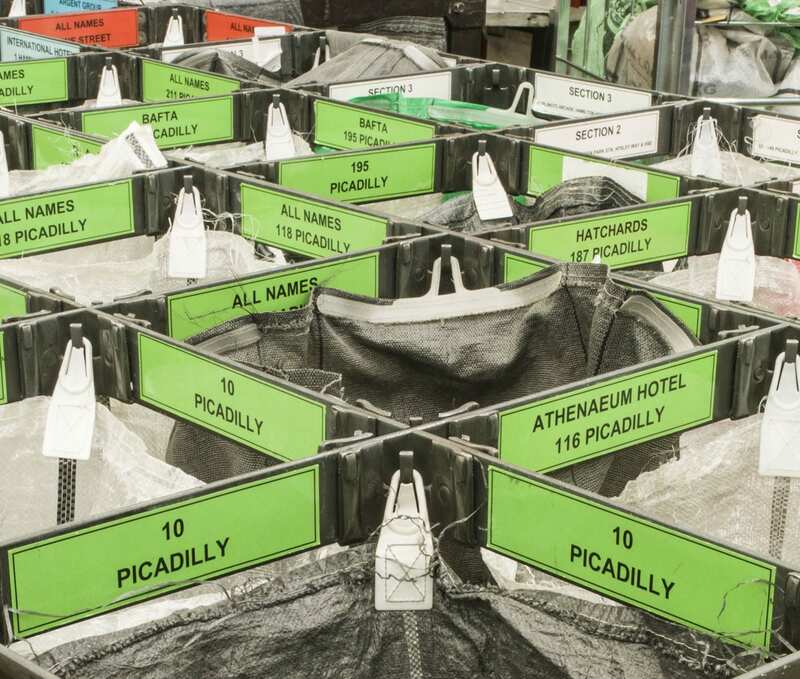 Later that year Royal Mail sold the site to Great Portland Estates, retaining an interest through a profit-sharing agreement. A new scheme was prepared and granted planning permission in 2013. This enlarged project, designed by Make Architects (Graham Longman, lead architect), has led to Rathbone Square, two L-plan blocks enclosing a central open garden or courtyard landscaped by Gustafson Porter and rising six to eight storeys for offices to the south-east, 162 dwellings to the north-west, with shops, restaurants and bars. The post office was demolished in 2014 and the new buildings have gone up since. The dormant Mail Rail line has been retained. The Berners Hotel is a rare instance of continuity in the area around Berners and Newman Streets. 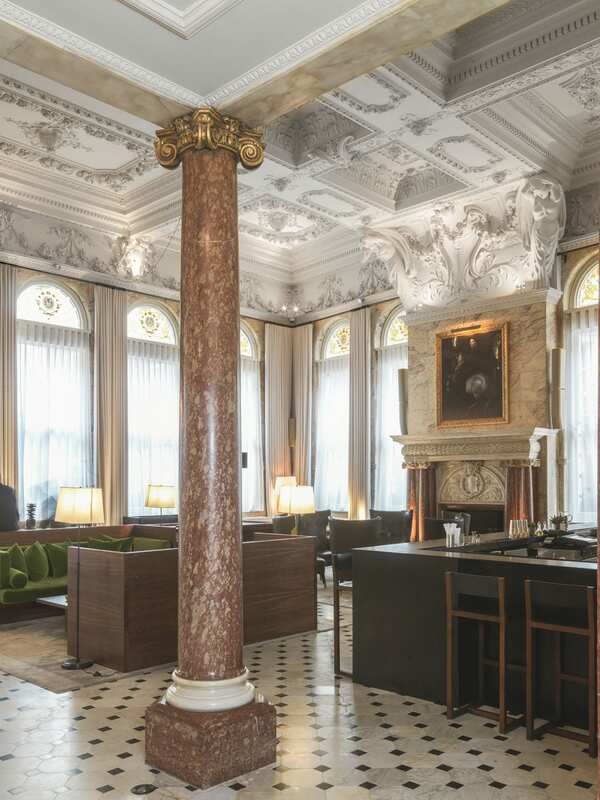 Though the current building dates only from 1905–11, the hotel can be traced back to 1826. 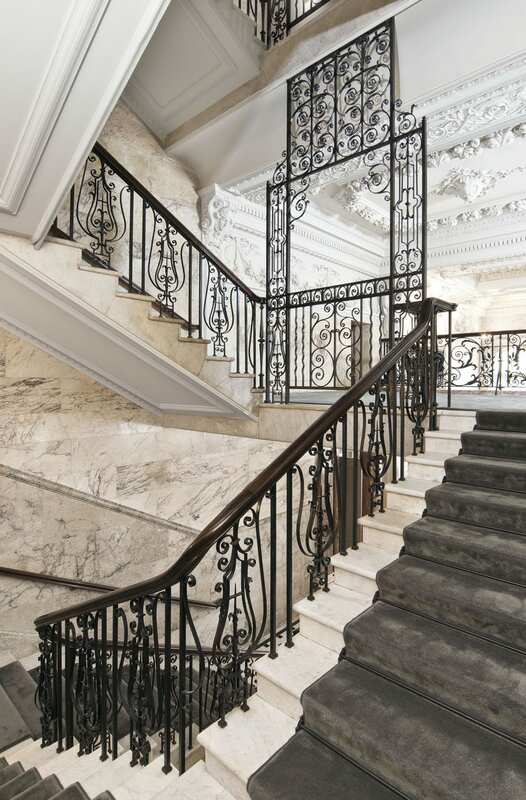 In that year the pair of houses at 6-7 Berners Street were converted from a bank into a hotel, involving the dismantling of a massive strong-room at the back constructed of iron and stone. The bank had been established in 1792 by the firm of De Vismes, Cuthbert, Marsh, Creed & Company. Later known as Marsh, Sibbald & Co., it failed notoriously when one of the partners, Henry Fauntleroy, was hanged for forgery in 1824. No such notoriety was attached to the hotel. 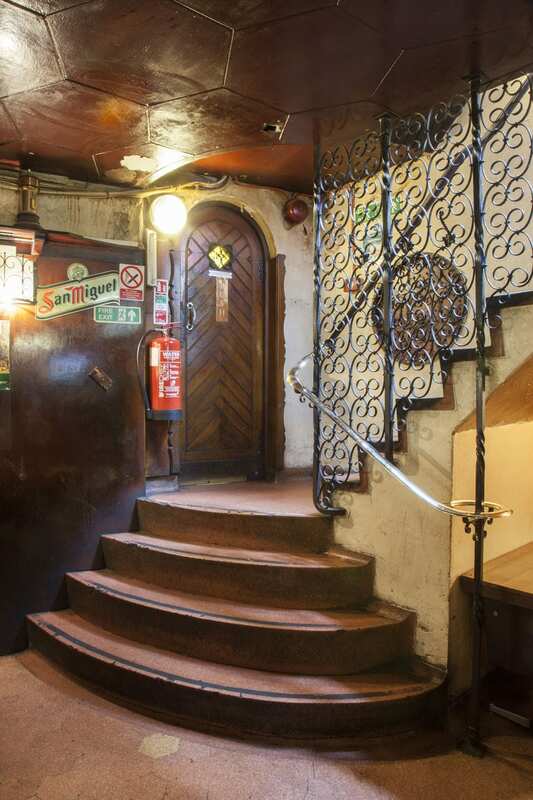 It was one of many, small family-run establishments in the vicinity of Oxford Street, where fashionable comers and goers mixed with longer-term residents. From the 1820s the private houses in Berners Street were increasingly being turned into lodging houses or shops. Pietro Rolandi’s Italian bookshop was one such at No. 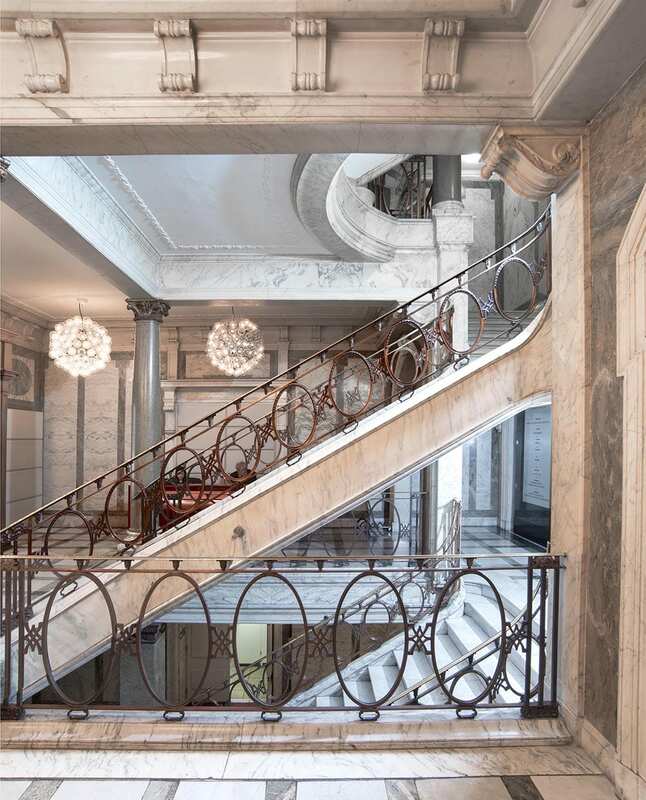 20, a haven for literary and political exiles, which first opened in the same year as the hotel. 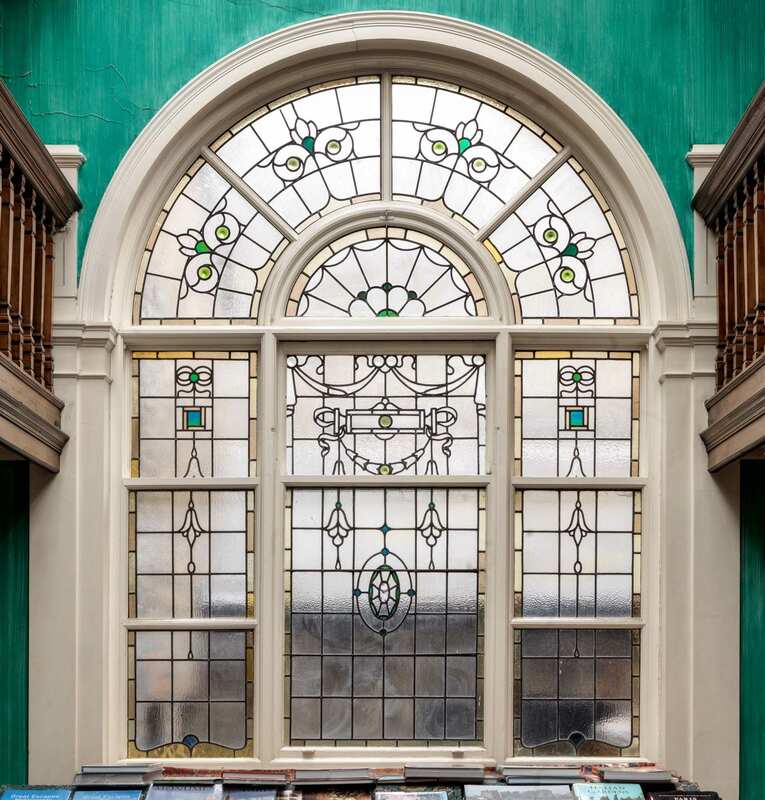 In 1880 the hotel’s then owner, Richard Kershaw, sold up to the Berners Hotel Company, which acquired building and fittings alike, barring a piano belonging to Miss Kershaw and an assortment of display cases of stuffed birds. 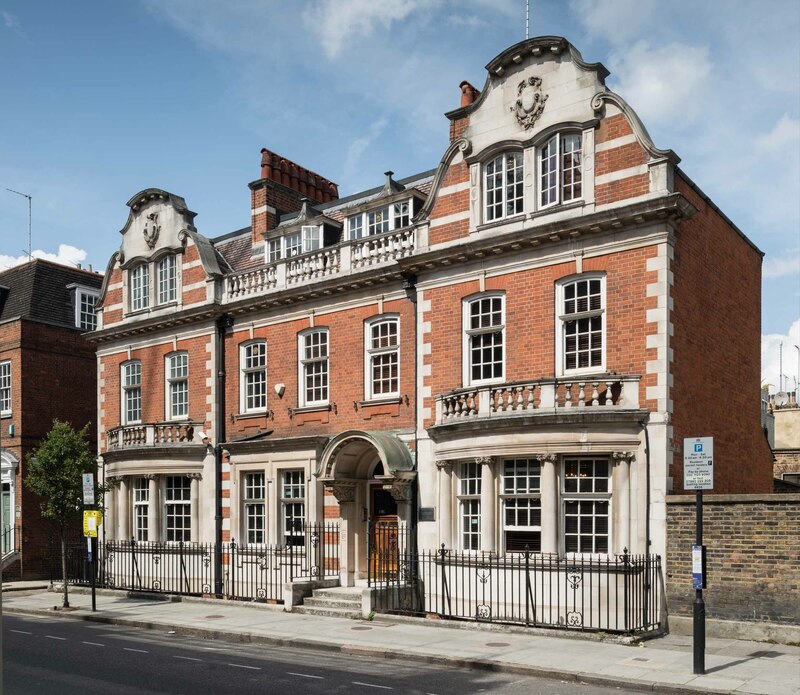 The company lasted a decade, being sold on in 1890 through Thomas Ward, of the London Music Publishing Company, to Berners Hotel Ltd among whose subscribers journalists (Henry Sutherland Edwards and George Augustus Sala) and minor musicians were strong. 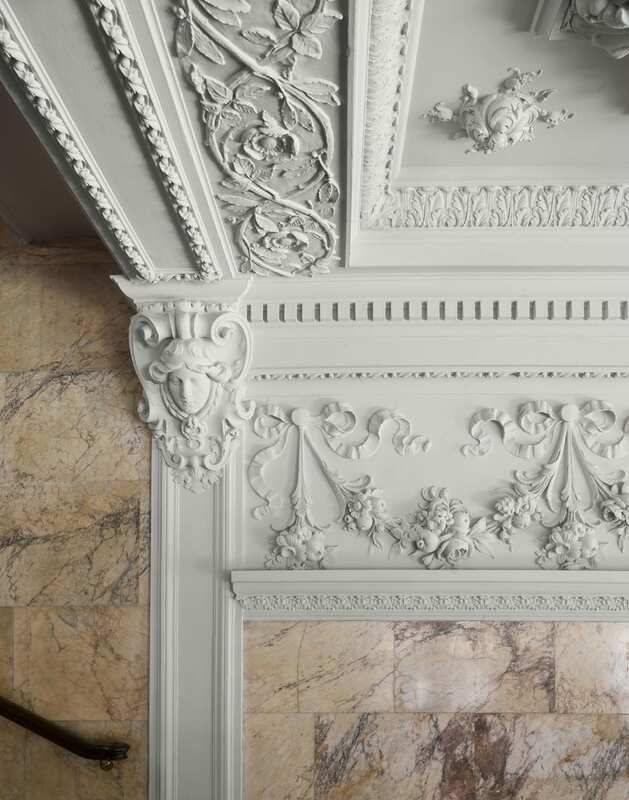 The hotel was renovated, and shamelessly puffed by the new management for its association with Fauntleroy and its ‘interesting woodwork, carvings, painted ceilings, &c’. Appropriately, in 1895 Ward, its managing director, was charged with the Fauntleroy-like offence of forging bills of exchange to do with the supply of beer and spirits to the establishment. Not long afterwards another hotel opened near by in Newman Street, the York Hotel. Its manager was Emmeline Lawrence, known as Mrs Mary Clark. A Welshwoman of considerable ambition, she oversaw the expansion of the York Hotel and soon became manager of the Berners as well. 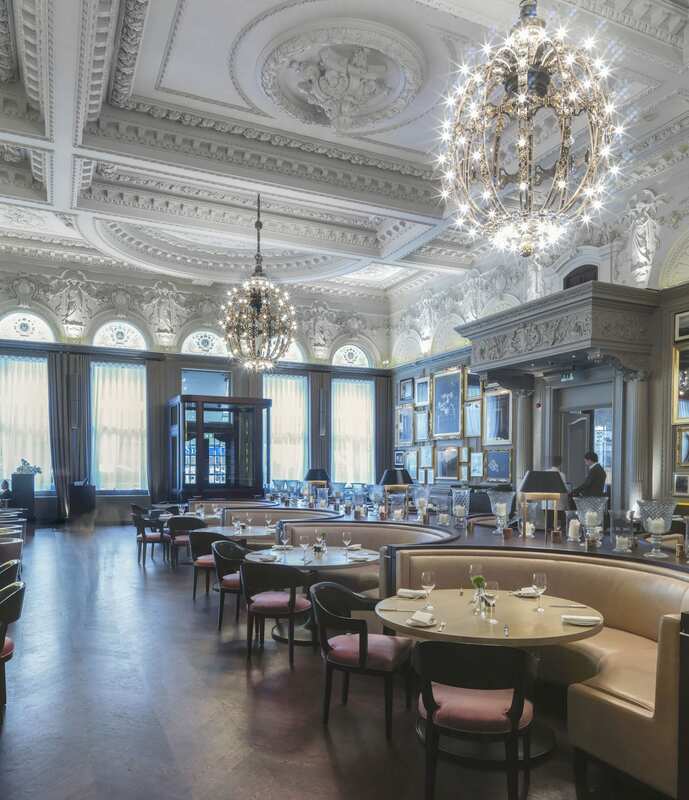 Backed by a fresh company, the Hotel York Ltd, she determined to rebuild the Berners Hotel on a much-enlarged site. Slater & Keith were commissioned to design the new building, which went up in stages. The first part completed was at the back, at 82–83 Newman Street and 73–75 Eastcastle Street, wrapping round the Blue Posts pub at the corner. The second, much larger western phase hit a snag when two Eastcastle Street houses, scheduled for demolition but still occupied, collapsed in 1908, killing eight men, all Austrian, German, Italian or Swiss employees of the hotel. The management also fought but lost a long legal battle with the LCC about fire doors or screens in the hotel corridors. 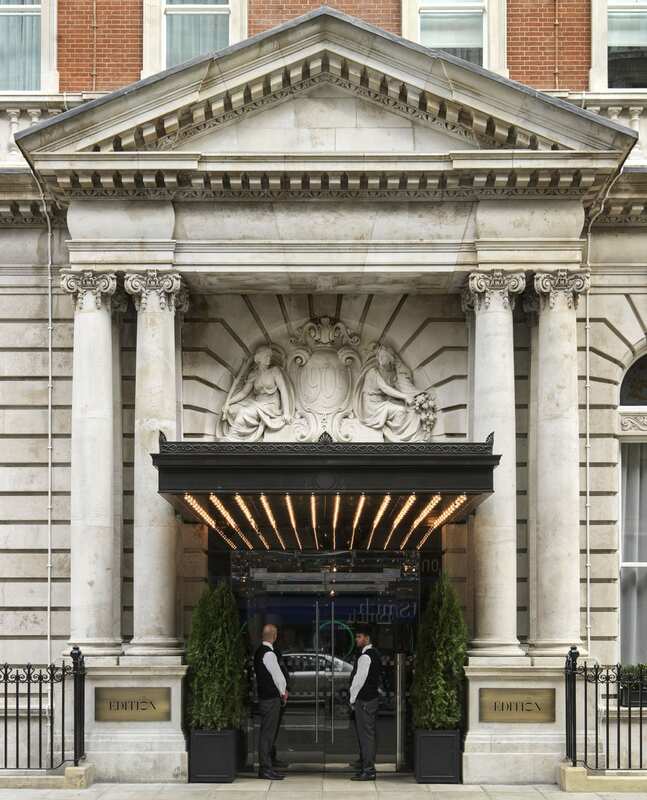 Once the rebuilding of the Berners Hotel had been completed in 1910, it was connected to the York Hotel by a subway under Eastcastle Street. 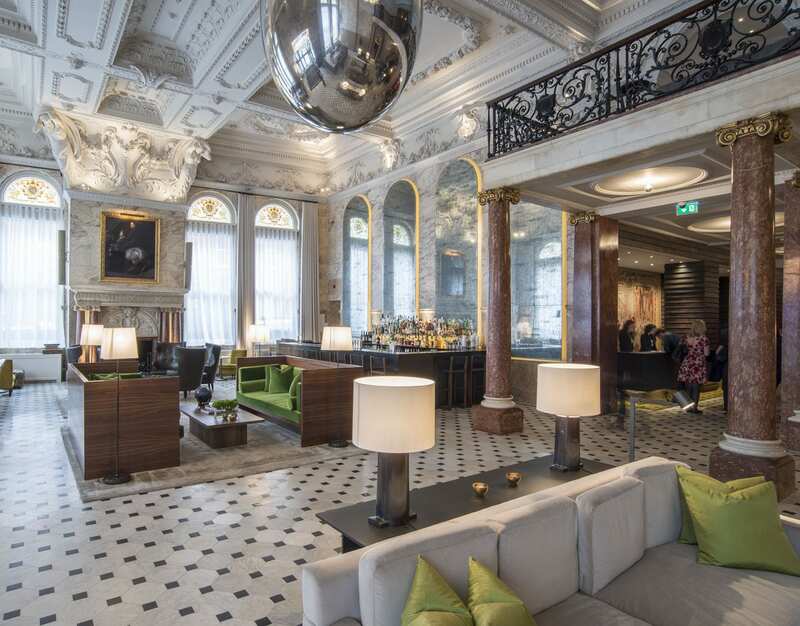 The two hotels thus linked both had their main ground-floor public spaces facing west towards Berners Street, where spacious coffee rooms, lounges and main stairs were to be found. But they looked quite different. The York with its two corner tourelles belonged to the late Queen Anne manner affected by Slater in the 1890s, whereas the later and bigger block of the Berners, perhaps attributable to his partner Keith, is an altogether more pompous Edwardian production, neo-Georgian in style touched by Frenchness, with plenty of Portland stone and carving to set off the red brick, a pedimented entrance, and two storeys in the mansard roof. 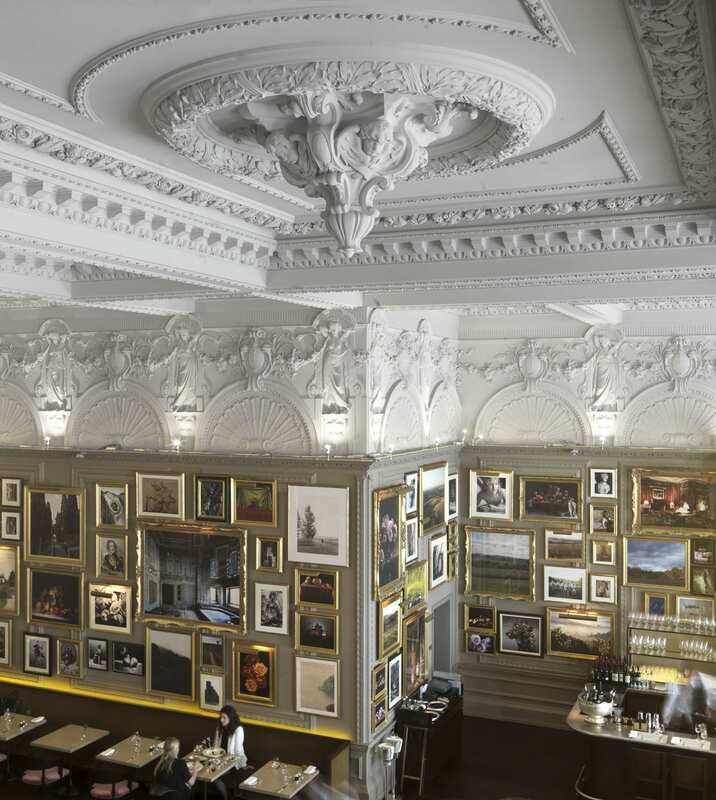 The lounge and coffee room were both double-height spaces, caked in opulent Edwardian plasterwork. 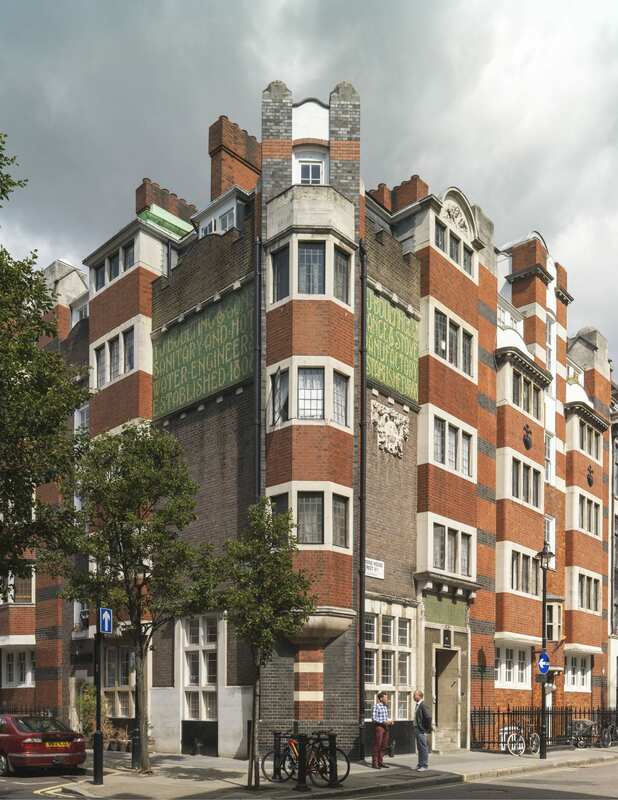 In 1912–13 Mary Clark tried to expand her hotel empire with an even larger scheme for the Princess’s Theatre site on Oxford Street, and in 1914–15 she ventured on a further new building at 74 Newman Street housing garages for her clients’ cars on two levels underneath five floors of open dormitories for maids. This landed her in financial trouble and she had to go. Under her successor, Henry L. Clark (no relation), the two hotels prospered. In the late 1920s hot and cold water, electric fires and phones were installed in every room; at this time the hotels claimed to be able to sleep 500–600 per night. The smaller York Hotel or Hotel York survived Government requisitioning in 1918 to acquire an extension designed by Slater & Moberly facing Newman Street (Nos 78–79) in 1932. But after it was requisitioned again during the Second World War it was not reopened, becoming a nurses’ home for the Middlesex Hospital in 1946, and then in 1997 a block of flats. The Hotel York Ltd maintained its independent management of the Berners Hotel till 1957. 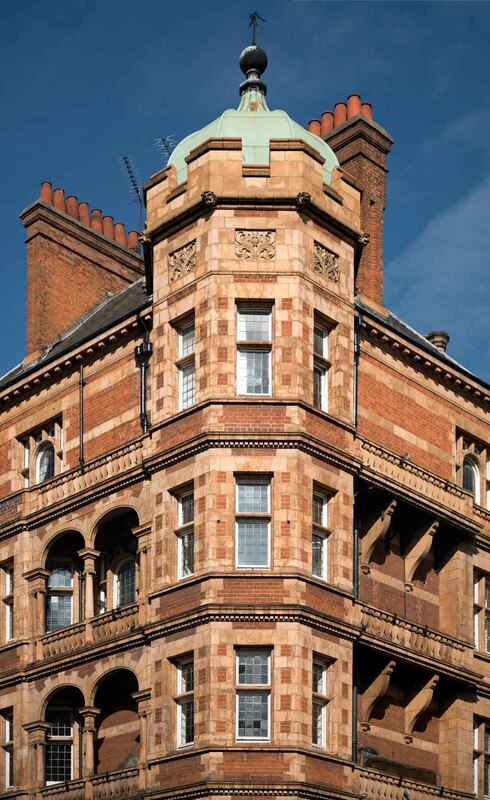 At the corner of Riding House Street and Candover Street stands one of South East Marylebone’s architectural gems: a group of flats designed for T. J. Boulting & Sons. 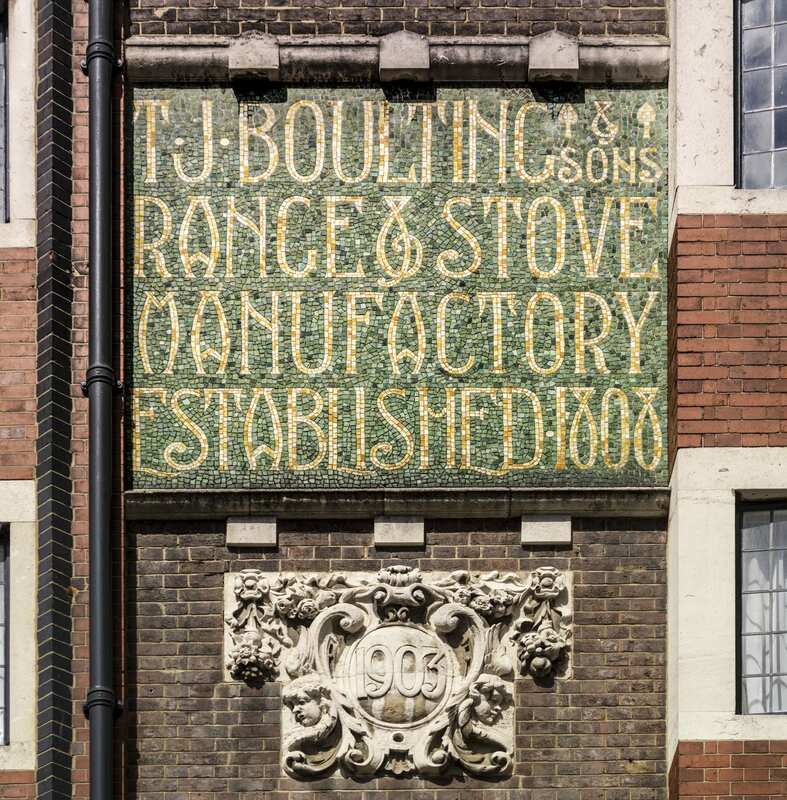 John Boulting & Son, furnishing ironmongers, were established perhaps as early as 1808 in two nearby houses. This is the date that is proudly displayed on the building, picked out in gold mosaic tiles along with the company name. Successive John Boultings died in 1863 and 1873, and a partnership dissolution between a third John and Thomas John Boulting was announced in 1879. 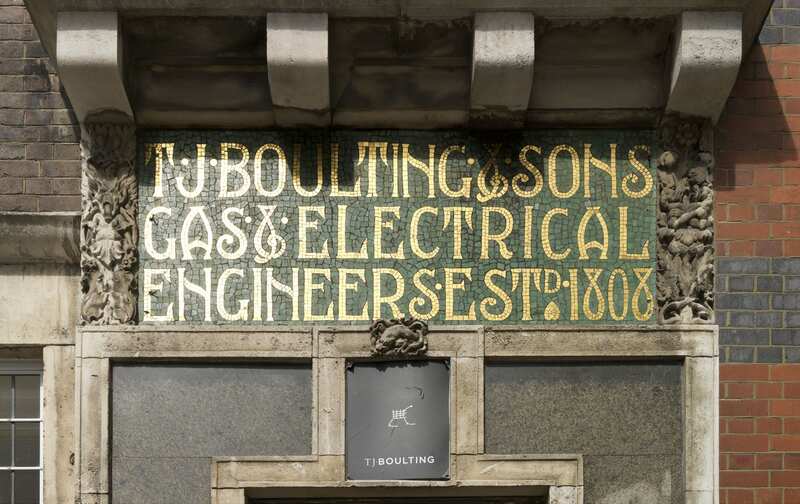 Thereafter the firm was known as T. J. Boulting (& Sons). 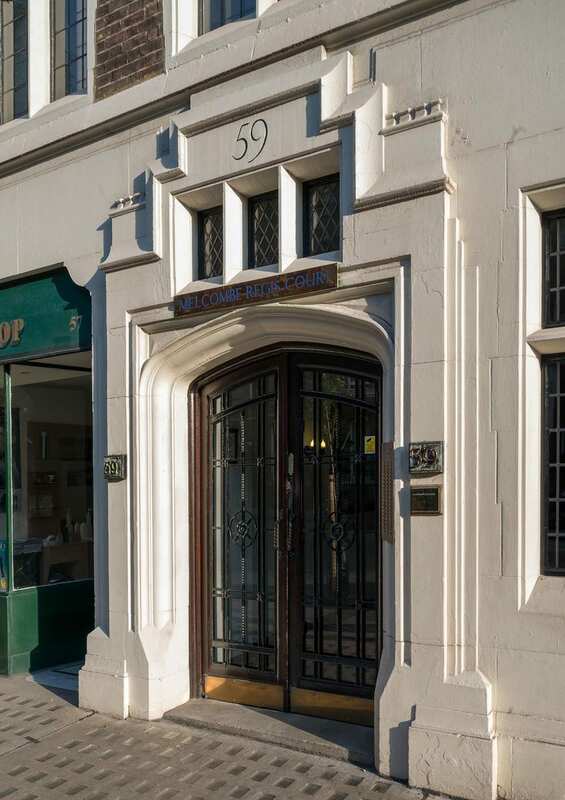 Among these sons was Percy Boulting, born about 1876 and seemingly architect-trained, to whose youthful aspirations the present buildings may well have been due. The firm had done well enough for members of the family, at first the father and then Percy’s brothers, to branch out into small property dealings on the Howard de Walden estate from the late 1890s. Naturally they took a special interest in rebuilding around their works. Their first venture appears to have been 40 Foley Street, a five-storey block of flats directly behind the Boultings’ address, built by John Anley in 1898. 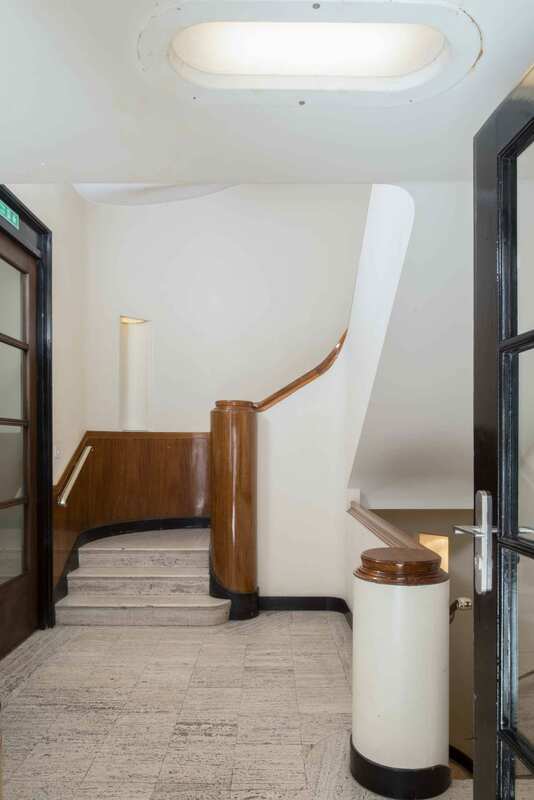 Its designers were then described as Clark & Hutchinson with Percy A. Boulting, in other words H. Fuller Clark and C. E. Hutchinson, two architects aged about 28 who had met in the office of Rowland Plumbe, plus the even younger Boulting. Later No. 40 was ascribed to Clark alone, and it is to him that the flamboyance of the Boultings’ cluster is usually credited. Clark’s masterpiece is the recasting of the Black Friar pub in the City; otherwise his work is little known, though he claimed to have a substantial practice. Architecturally, No. 40 is an up-to-date but not eccentric performance which breaks into roughcast at second-floor level and terminates in two shaped gables. The plan follows the standard late Victorian arrangement in this quarter of two flats per floor, originally with a sanitary excrescence at the back in the form of a central stack of bays shared between two flats. 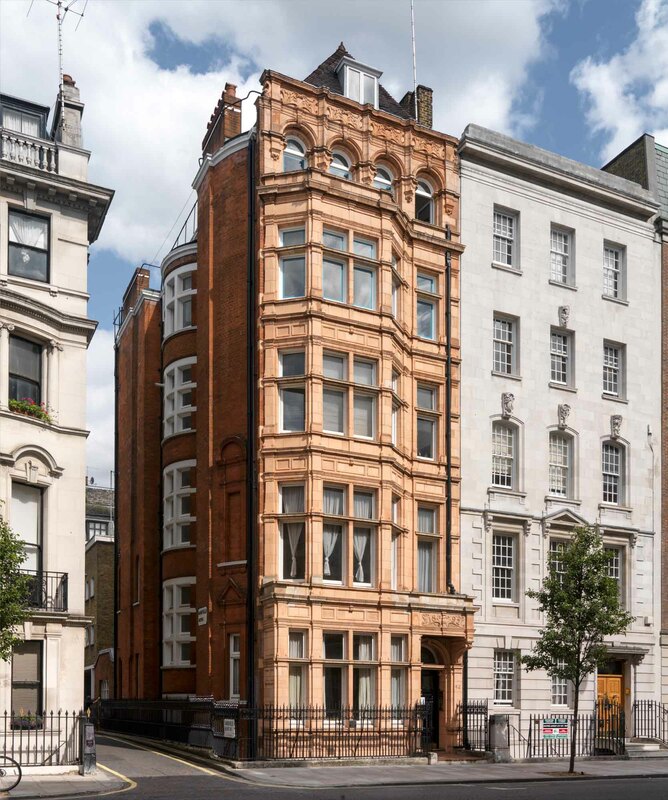 Clark & Hutchinson promptly followed up in 1899 with a second block of flats opposite, Belmont House, 5–6 Candover Street, built this time by A. A. Webber. Here a similar plan is fronted in a weightier, fussier idiom, with a great belt of purple brickwork enveloping the first floor and a dab of Art Nouveau lettering. Tower House, York House and Oakley House, encompassing the Boultings’ former premises and the Sir Isaac Newton pub on the corner, followed on in 1903–4. 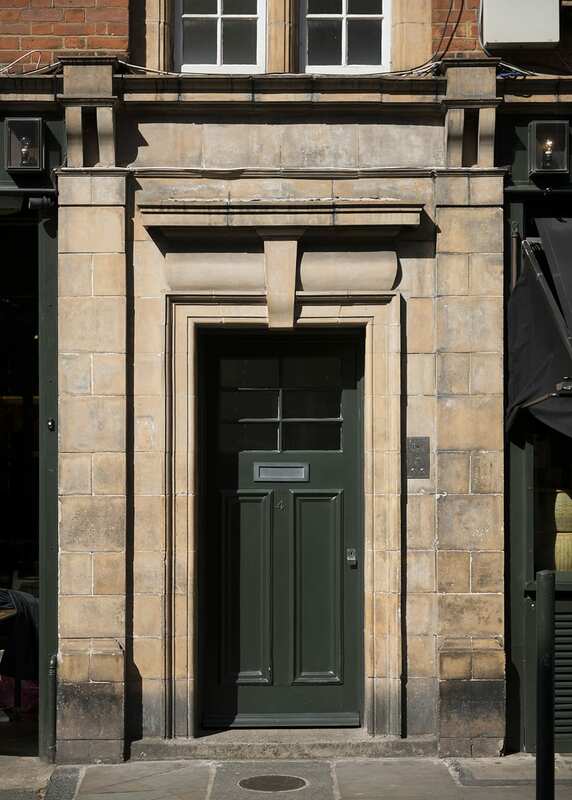 This time the architects were described as Fuller Clark and Percy Boulting, without Hutchinson: the builders were Smith & Co. of Mount Street. Again these are essentially five-storey flats, though the backs go one storey higher; here too were originally bare sanitary stacks of bay windows. The fronts are the reverse of bare. 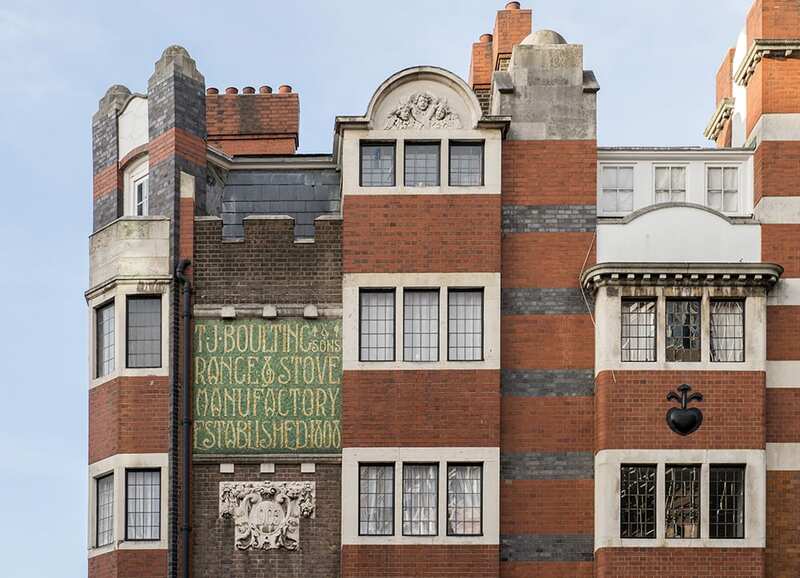 Among the tricks set to work are brickwork bands of startling hues, bay projections both canted and square, a bristling roofline and three separate fancily lettered mosaic panels advertising the Boultings firm and its wares (‘gas and electrical engineers’; ‘sanitary and hot water engineers’; ‘appliance and stove manufactory’). Colour was an evident preoccupation; originally three different cements were used, while the window joinery was all white apart from the bay windows, finished in stained oak. Despite the hint of Voysey about these elevations, they are entirely individual and indeed this building too was attributed to Clark alone when it was republished. The Boultings firm survived at 59 Riding House Street up until the 1960s. In 1978 the freehold of all their flats passed to the Community Housing Association, which employed Pollard, Thomas & Edwards, architects, to update them over the subsequent decade. Their changes included enlarging the sanitary bays at the back to form more generous kitchens. 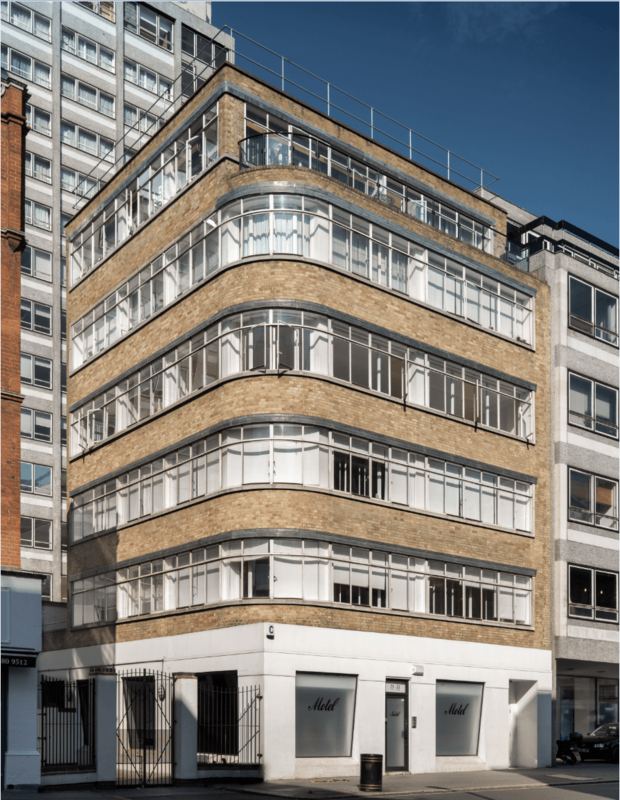 This building is a little known work by Joseph Emberton, showrooms of 1937 that would have been more boldly Modernist but for compromises that arose from the fact that the freehold of this entire street block was held by the Crown. 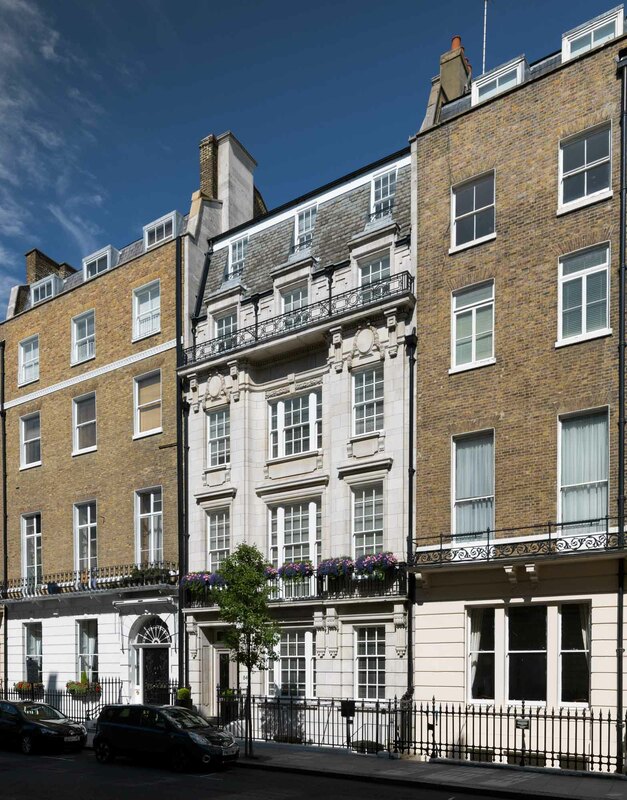 The site’s leaseholder from 1920 was Julius Turner (born Tanchan), who lived at 58 Portland Place and was a major figure in Great Portland Street’s motor trade through his control of Thorns. Turner stutteringly converted two shops for motor showrooms, first dubbed Crown Motors. In 1927 he asked the Crown Commissioners for a building lease at 71–77 Great Portland Street, wanting to build a ‘magnificent Motor Showroom’. He was rebuffed. Trouble had been caused by his parking and washing of cars, ‘Mr Turner (who is a naturalized Polish Jew) is not a particularly desirable tenant’. A second approach in 1929 also failed, but a more modest proposal for refurbishment of Nos 71–73 for Thorns gained approval in 1931. Turner then fell ill, suffering what was called a nervous breakdown in 1933. He returned to the fray in 1934, submitting new plans for rebuilding Nos 71–73 as motor showrooms below workrooms and offices. 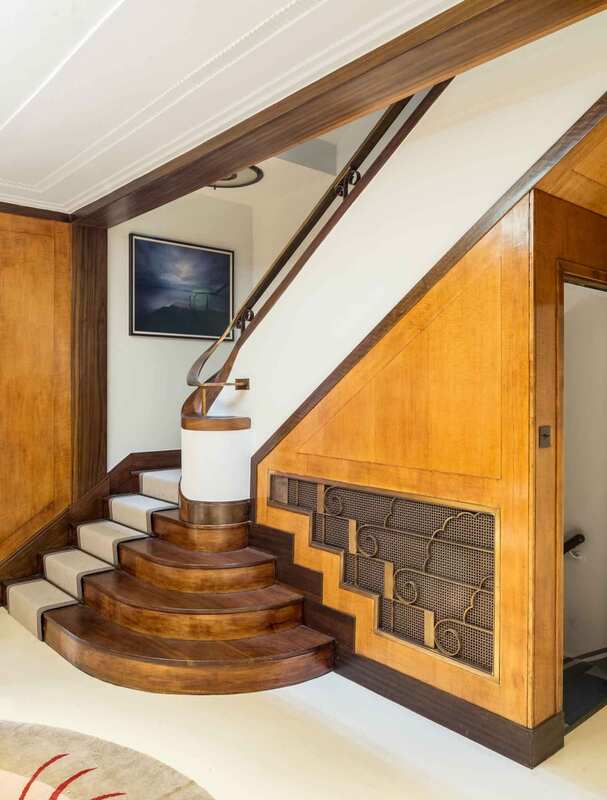 His architect now was Emberton, and the scheme was bold. The project, which proposed a dark vitrolite cladding, like that of Fleet Street’s Daily Express building, anticipated Emberton’s designs for Simpsons Piccadilly by a year. Emberton was ready to compromise when the delays were deplored by Turner in May 1935 at which point he, with his brother Joshua Philip Turner and Harold Gershom Vickers, was fined £1,010 for under-declaring the value of four imported cars and thereby defrauding Customs of £453. 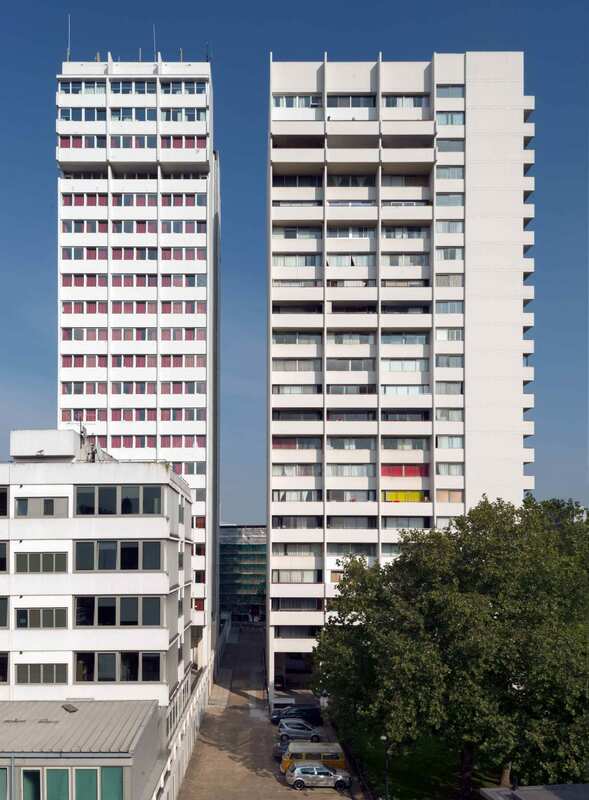 The Crown Lands Advisory Committee, which included Raymond Unwin and Frank Pick, made no objections to Emberton’s design other than to a proposed seventh storey and to the vitrolite cladding, suggesting stone or reconstructed stone instead. Turner, who had relaunched as the Lansdown Trust, was given new leases in 1936 but his desire for a reduction in rent caused further delay. 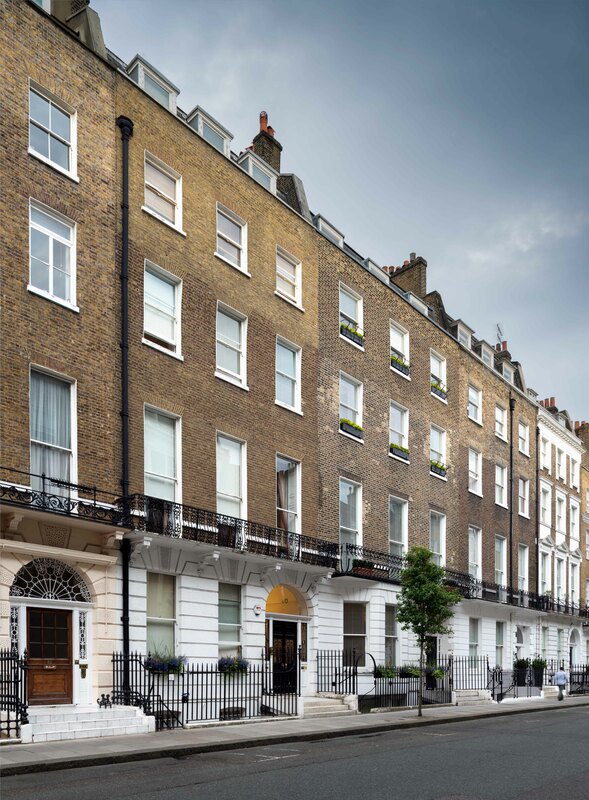 Meadows urged Portland stone cladding, but Emberton pointed out that Great Portland Street was ‘mostly a brick street’ and suggested yellow brick, with the shopfront to be clad in the Empire Stone Company’s artificial Portland stone. The showroom and workroom building went up in 1937, with Dorman Long & Co. steelwork, Hunziker bricks (new to the UK), and John Knox (Bristol) Ltd as builders. Motor showroom use was short-lived and the building stood empty after the war. Numerous and miscellaneous occupants since have come mainly from the garment trades, but have also included artificial-flower makers and, in the early 1970s, Hermes Computing Services Ltd’s punched-card service bureau. The ground floor has been reshaped and the building has lately been occupied by Motel, a fashion label.